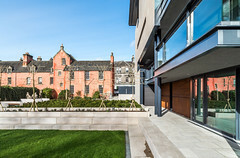 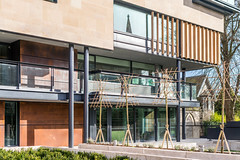 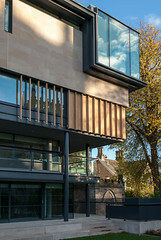 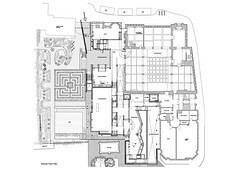 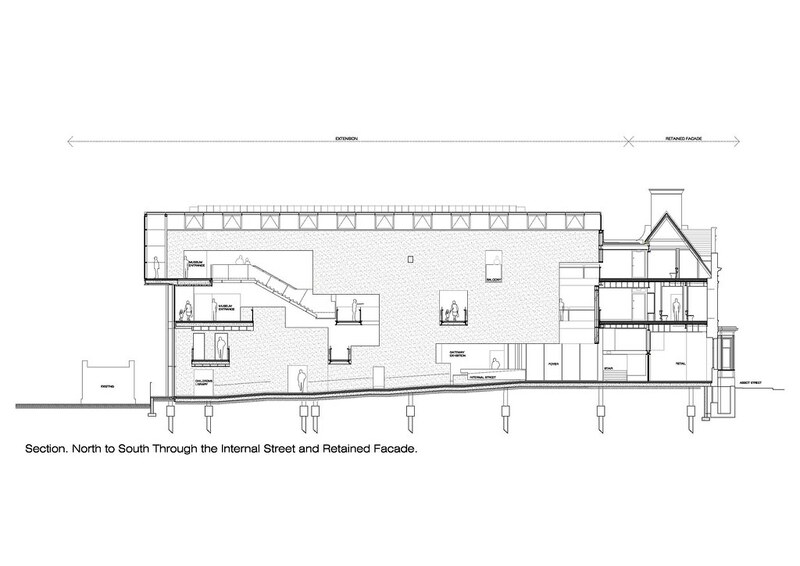 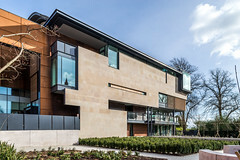 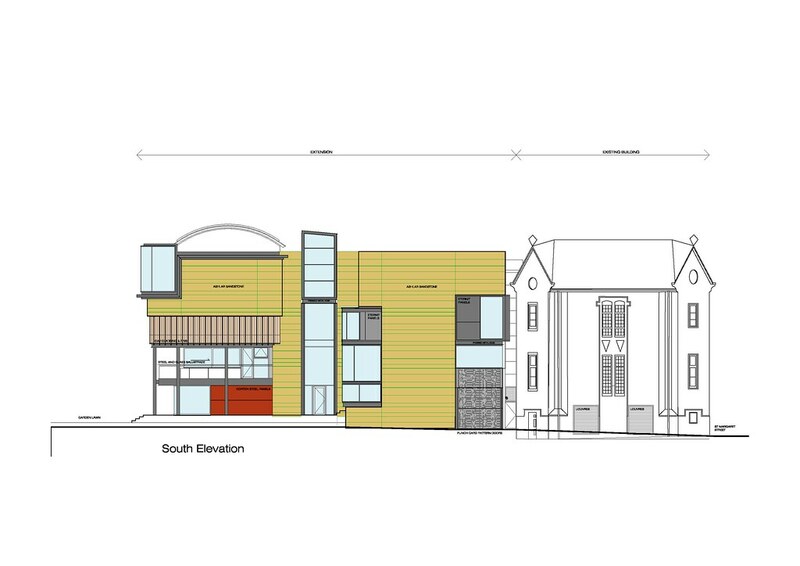 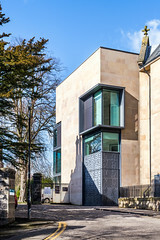 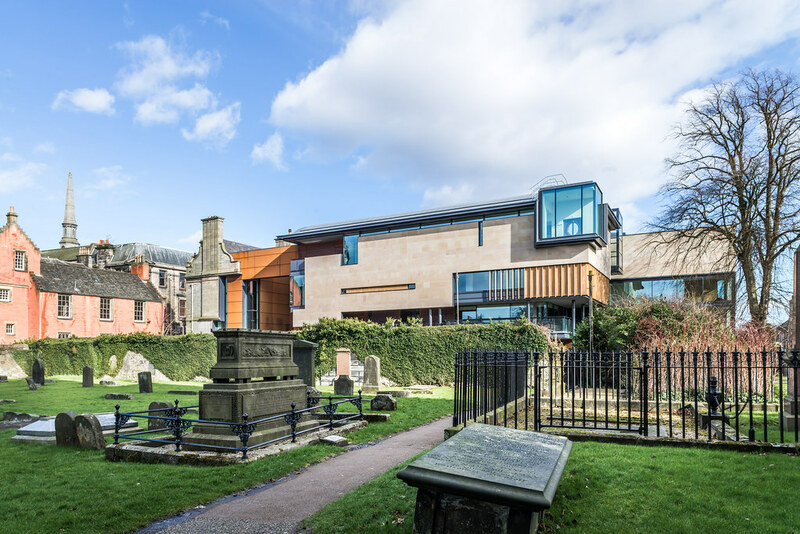 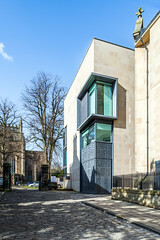 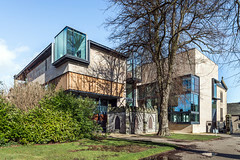 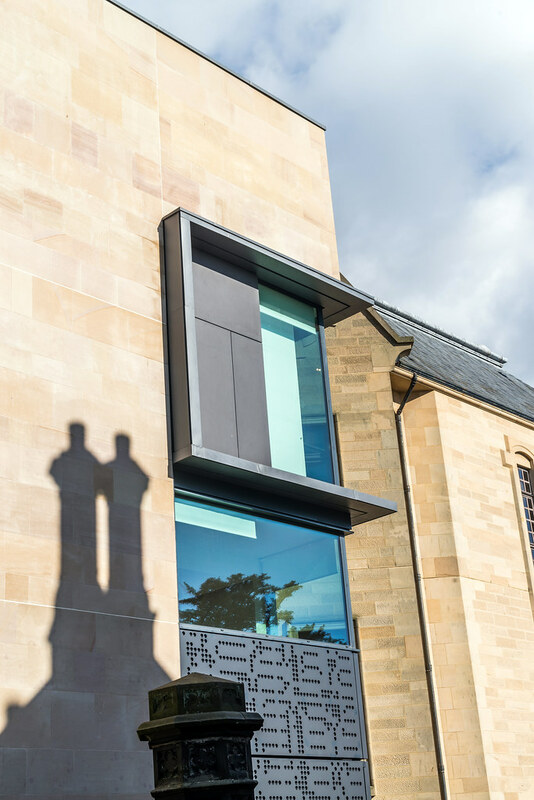 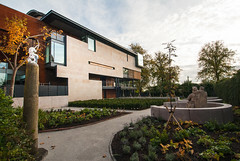 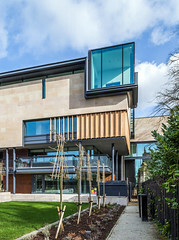 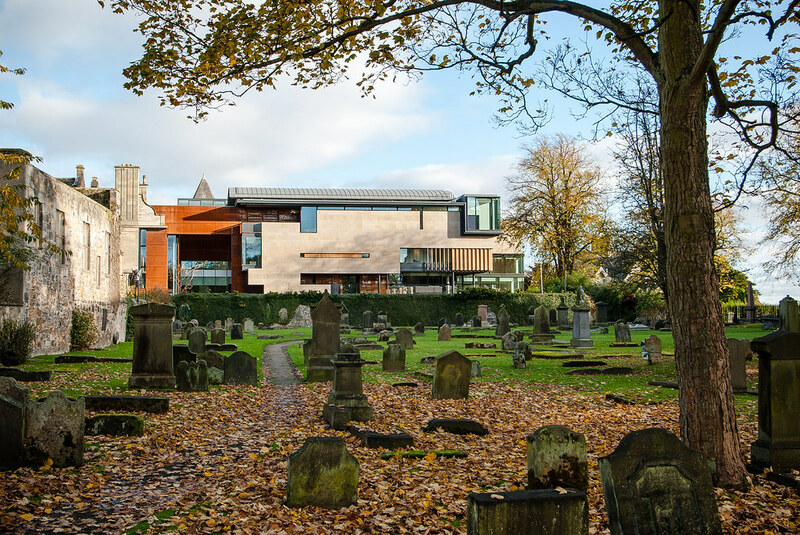 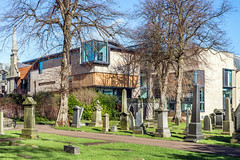 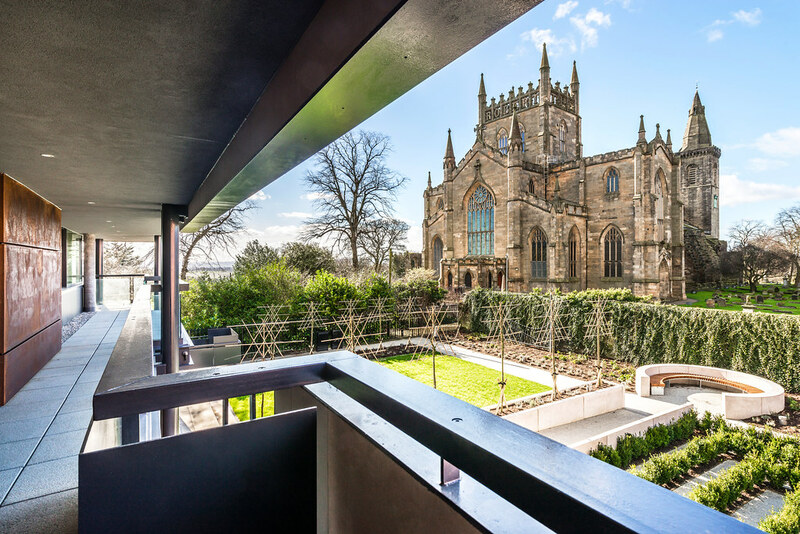 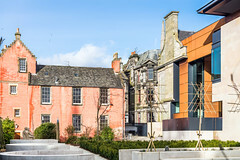 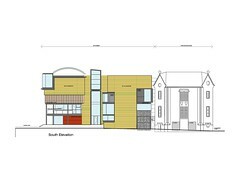 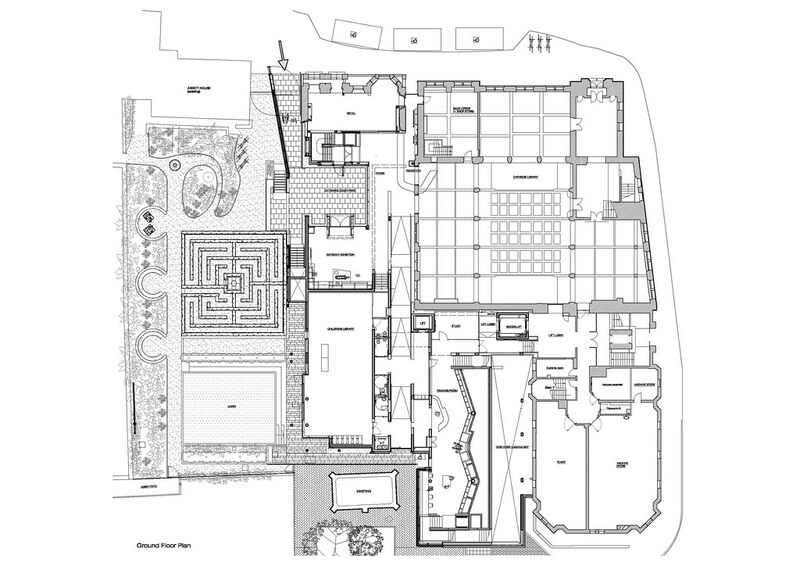 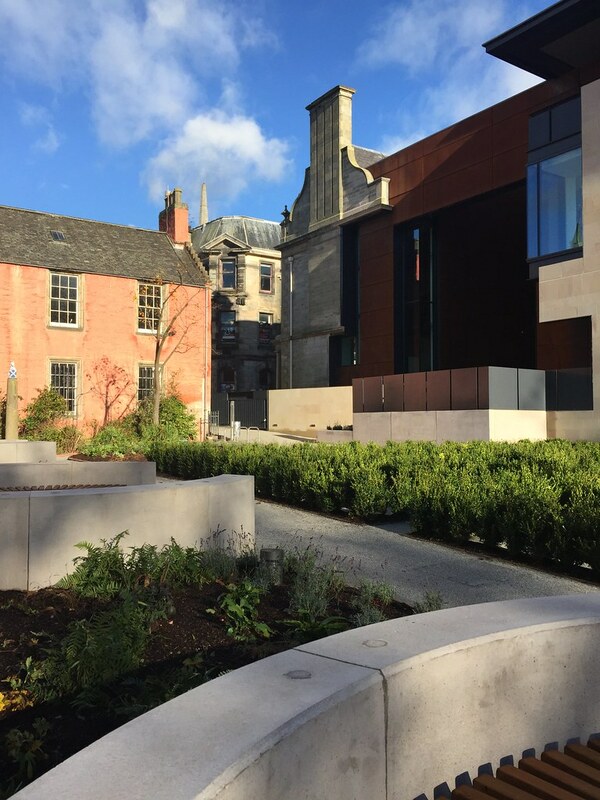 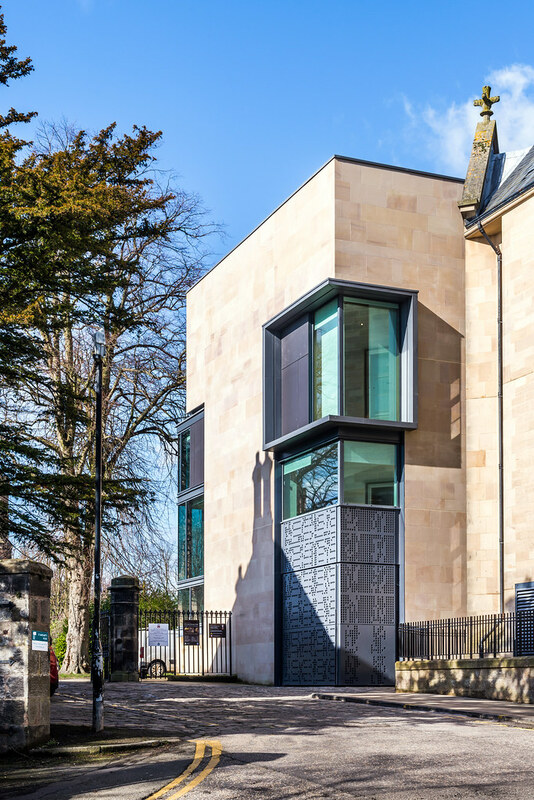 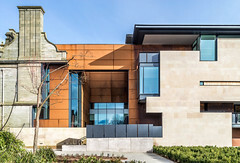 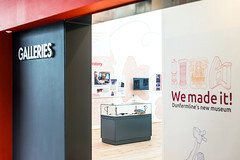 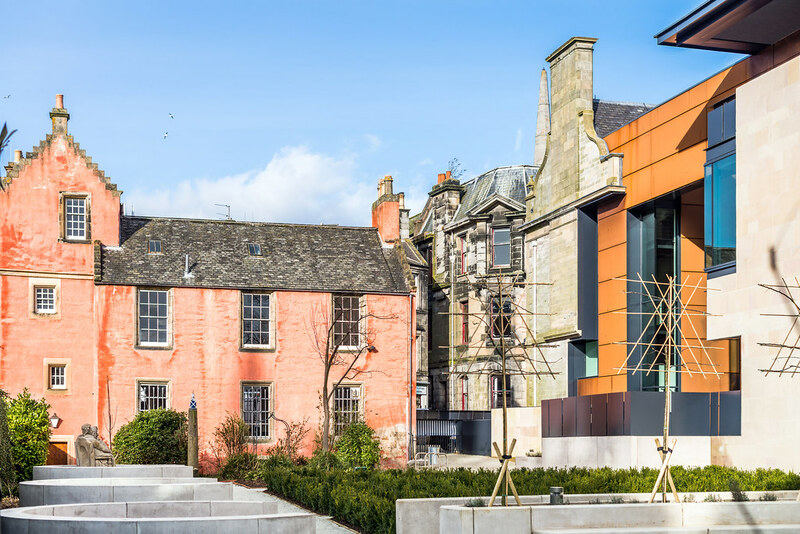 In 2007 Richard Murphy Architects won a competition organized by Fife Council and the RIAS for a major new cultural centre in the historic centre of Dunfermline. 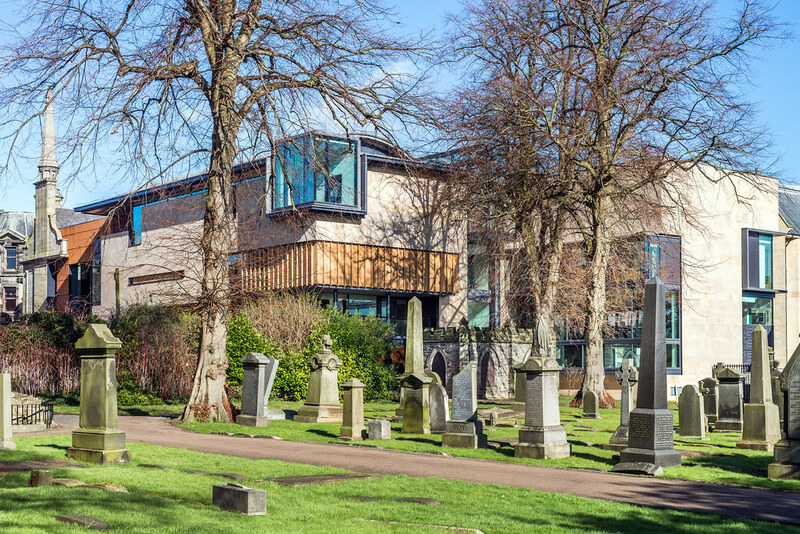 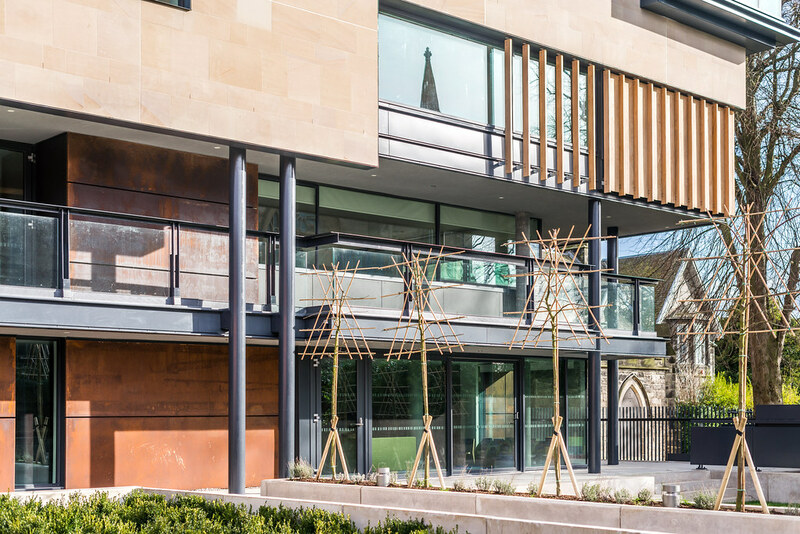 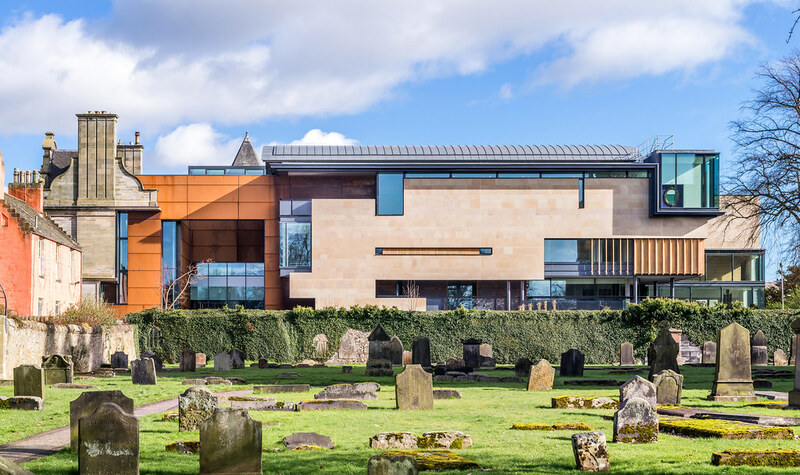 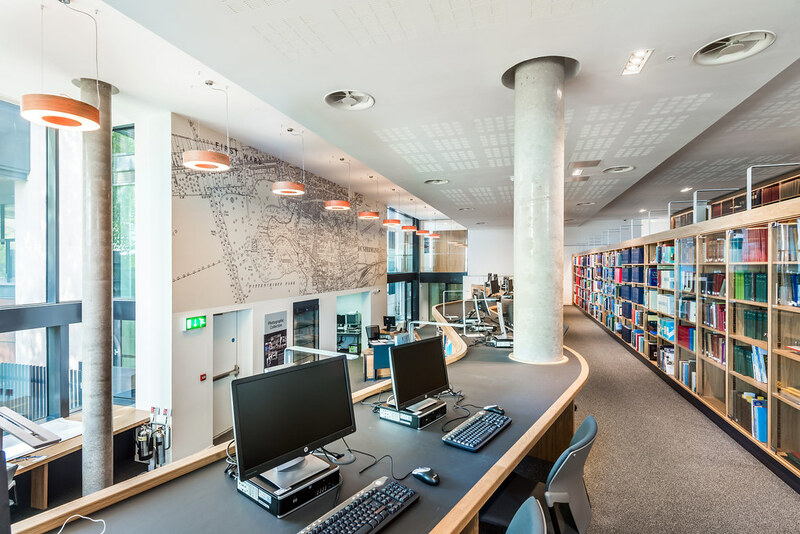 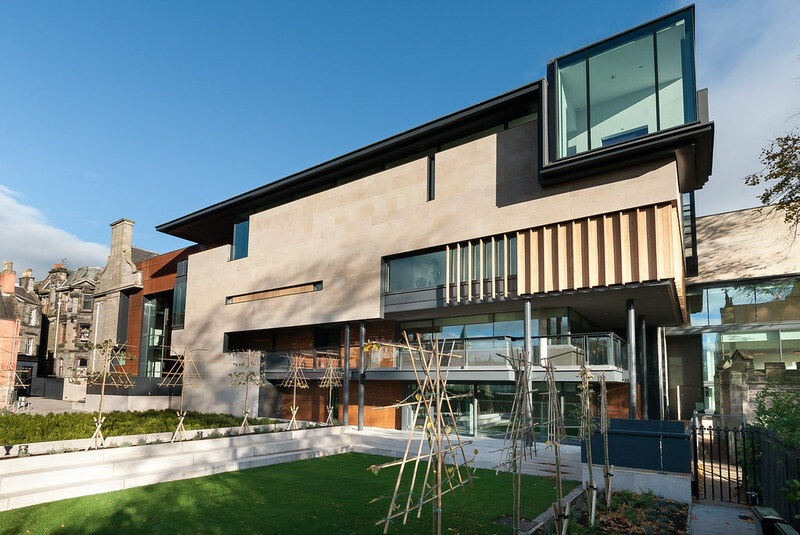 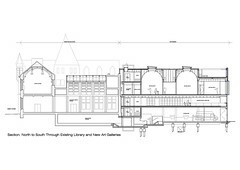 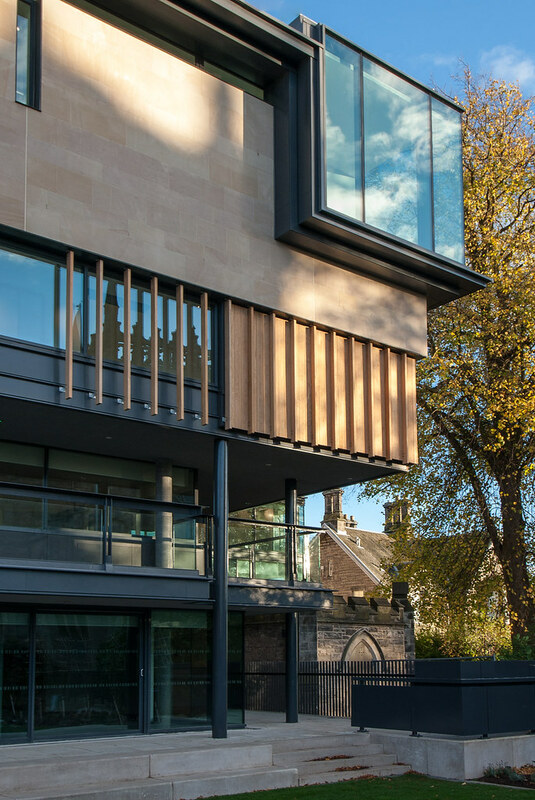 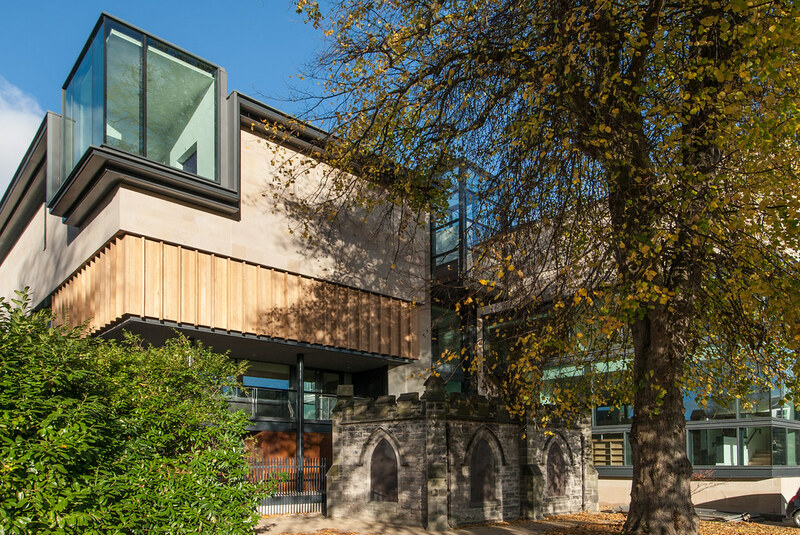 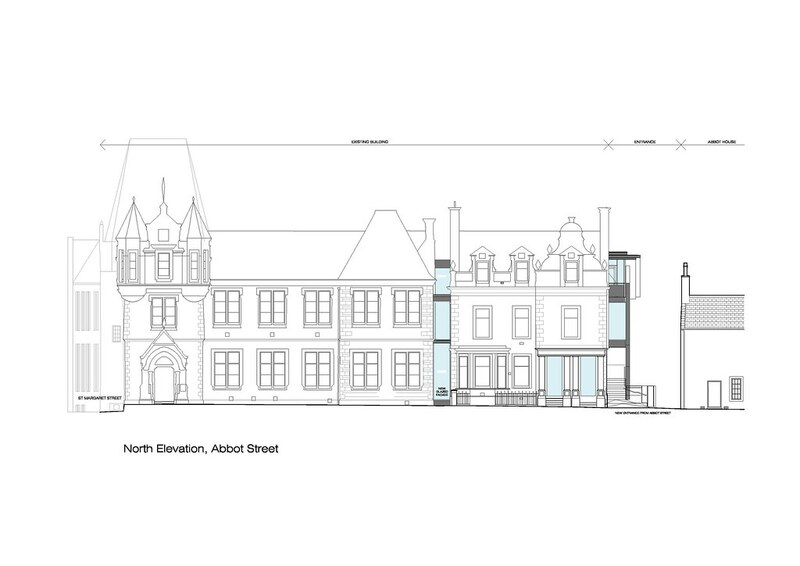 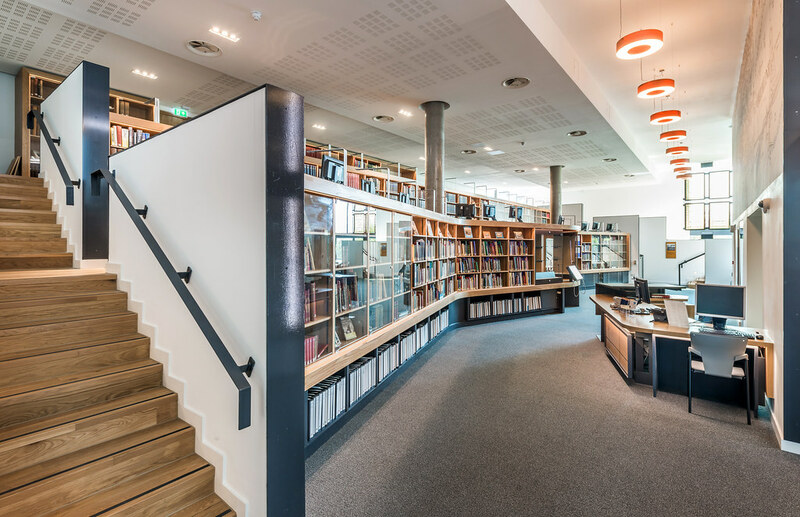 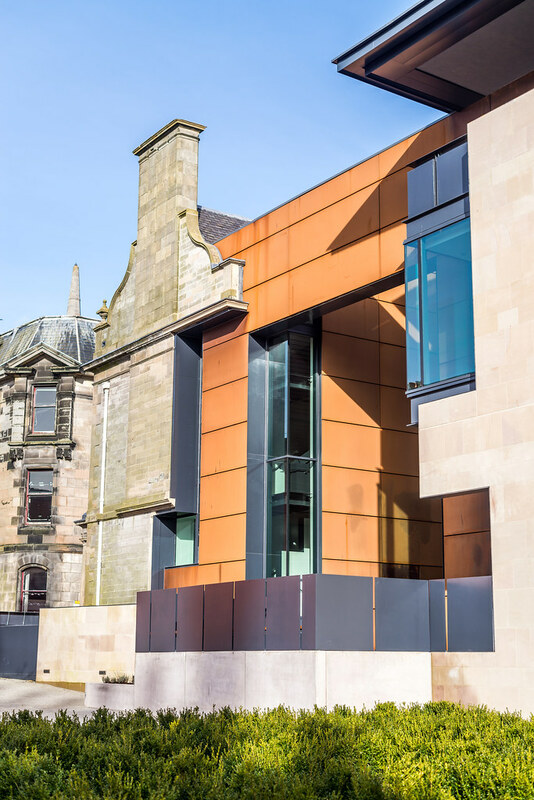 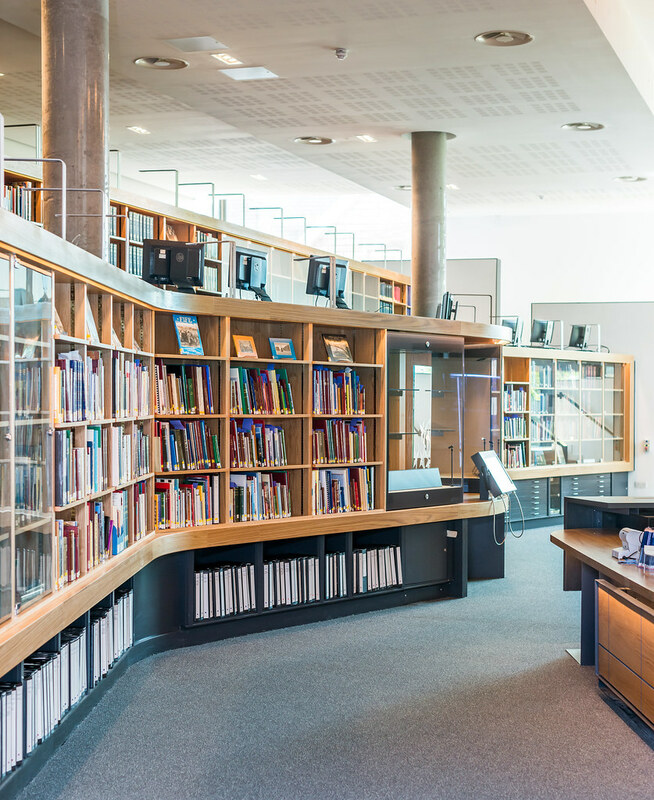 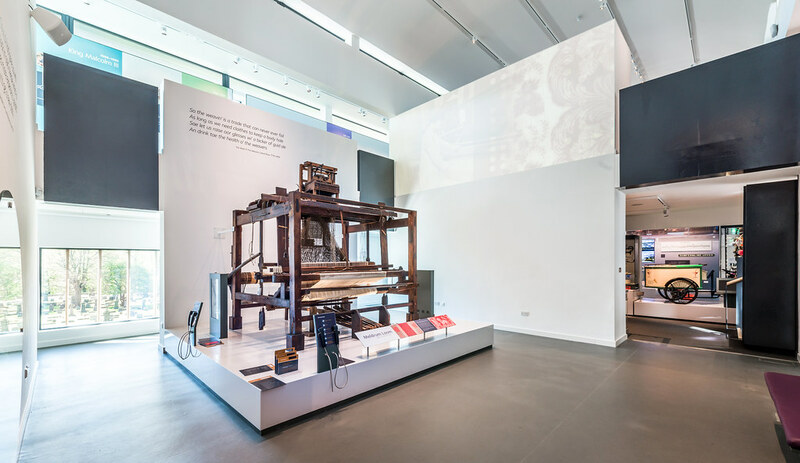 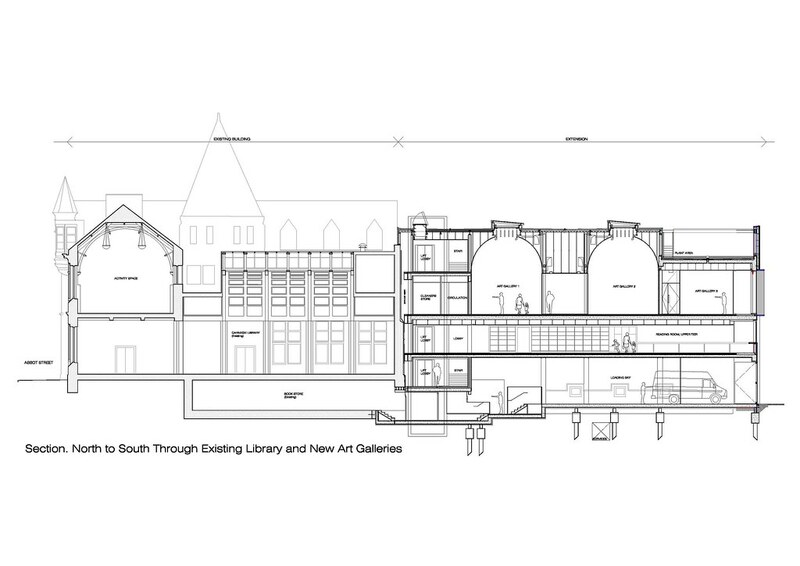 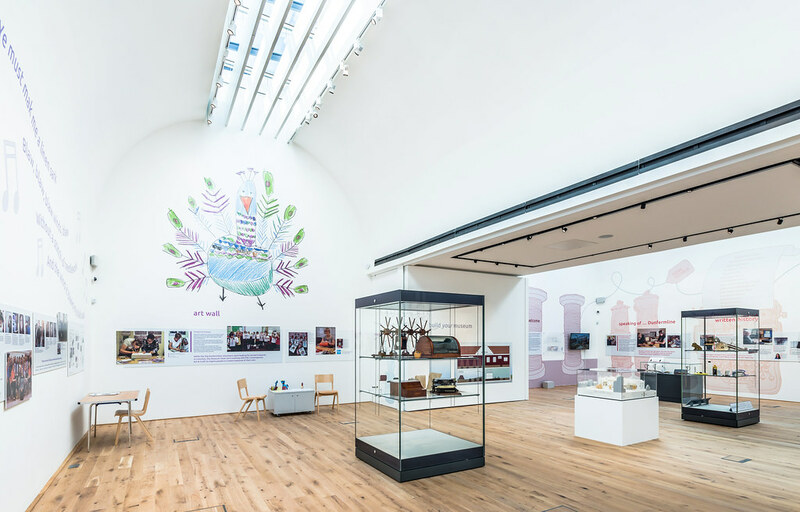 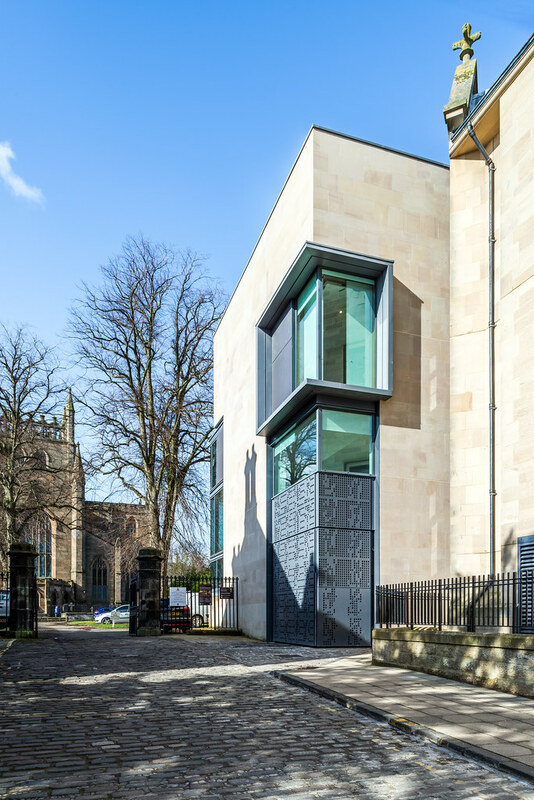 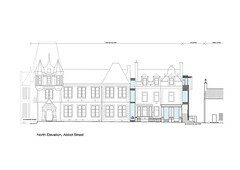 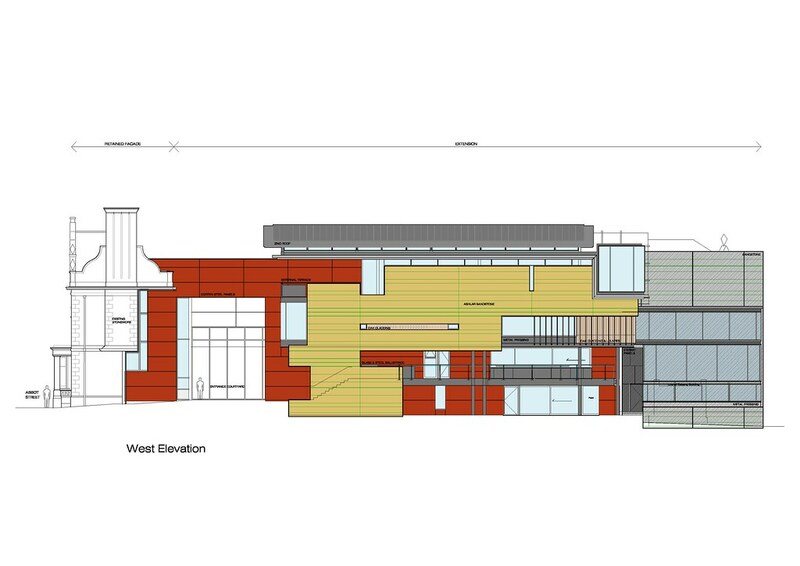 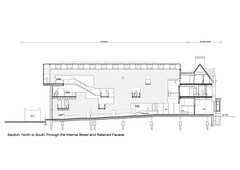 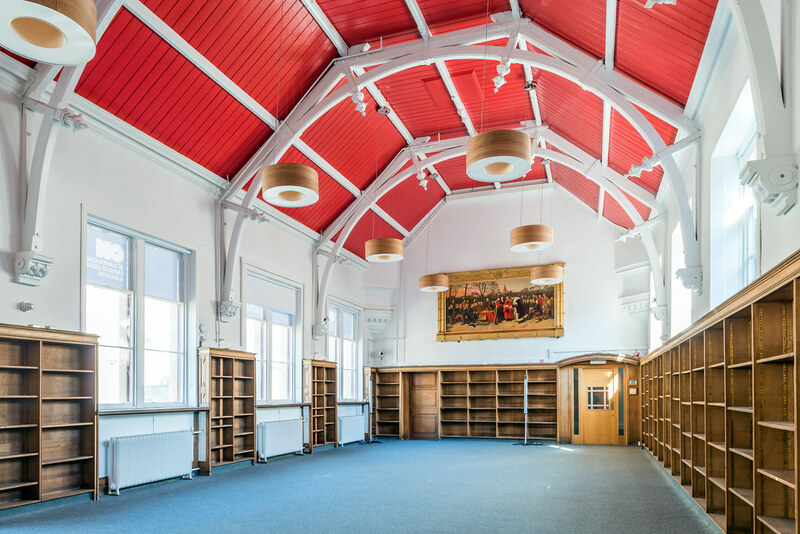 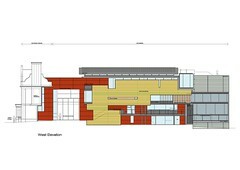 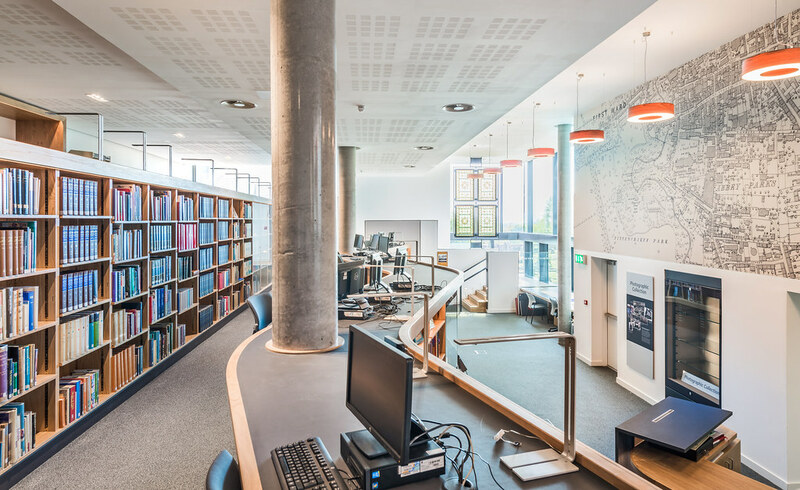 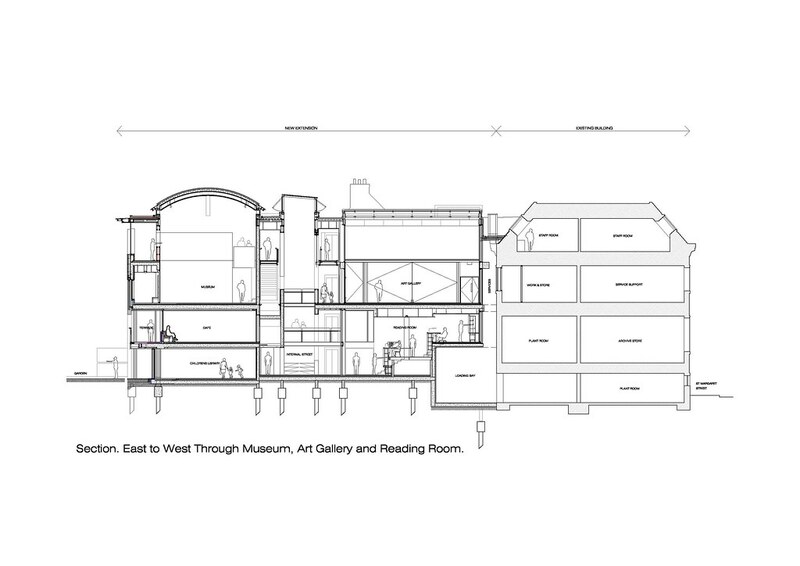 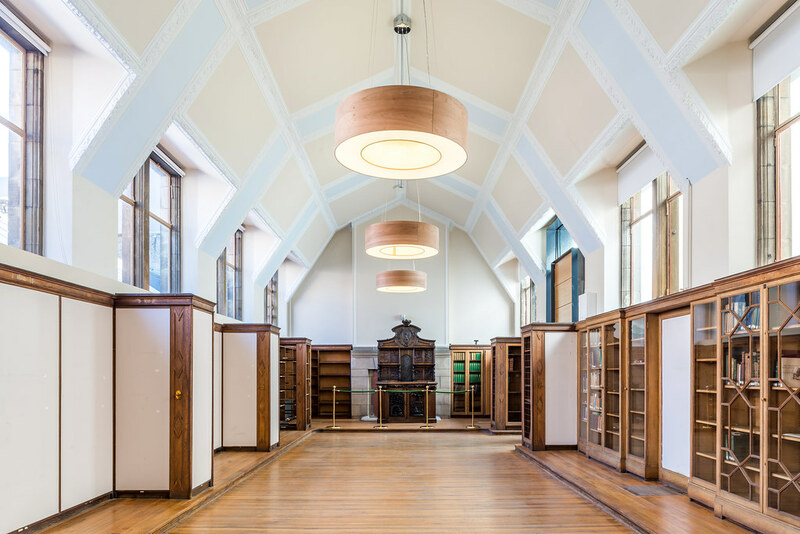 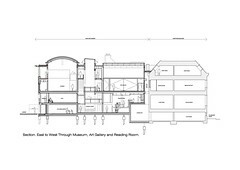 The brief envisaged a museum space, art galleries, local history archive and reading room, childrens’ centre, café and meeting rooms lying alongside, and integrating with, the world’s first Andrew Carnegie Library, a Grade B listed building. 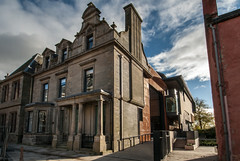 A Grade B listed former bank building was also part of the site. 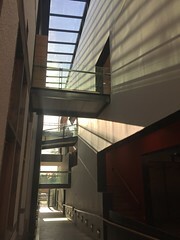 The competition design organized the new building along a new top lit street with a journey to all the facilities criss-crossing the street on bridges to the top of the building. 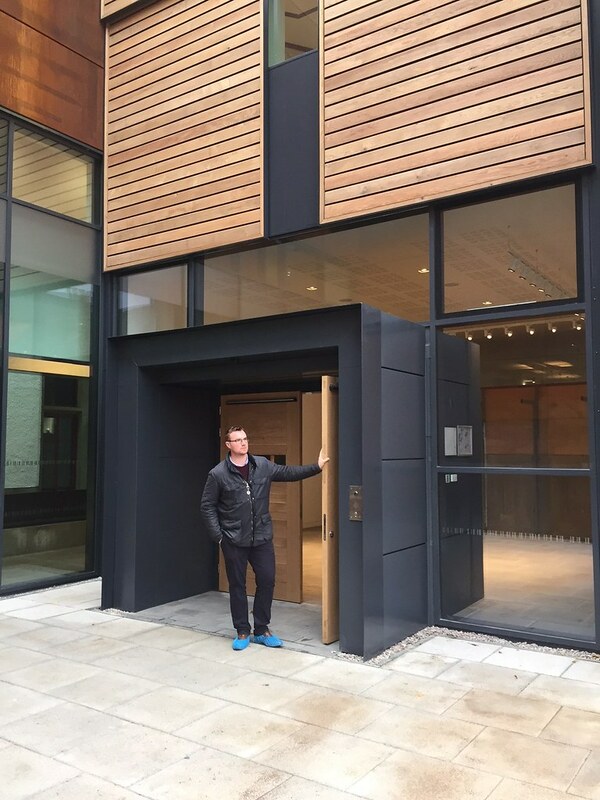 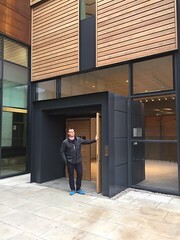 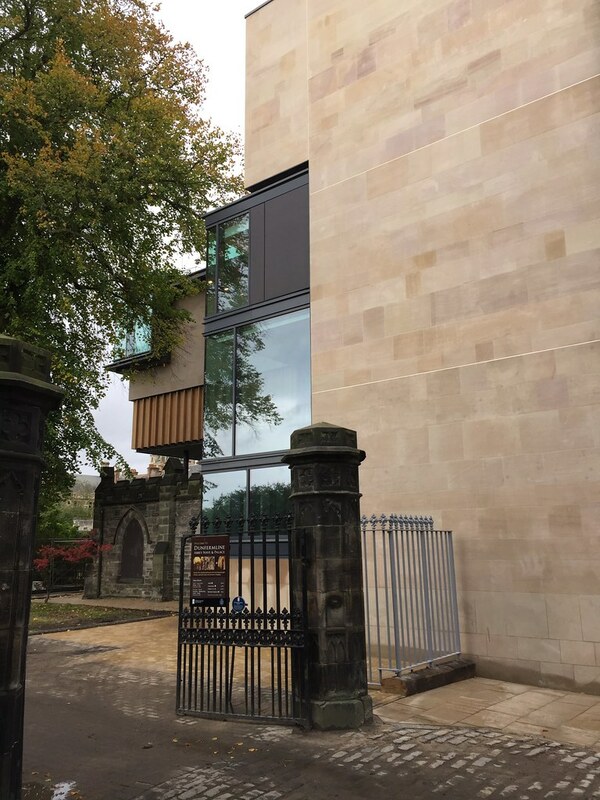 The entrance proposed hinging a giant slice of the former bank façade to form the new entrance and although welcomed by everyone as a very exciting and innovatory way off entering the otherwise landlocked site Historic Scotland refused to consider the idea. 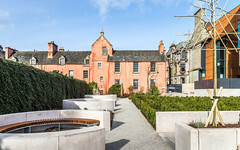 Eventually the Council were able to purchase an adjacent car-park and this we proposed to convert into a walled garden which in turn leads to a new entrance courtyard off this garden. 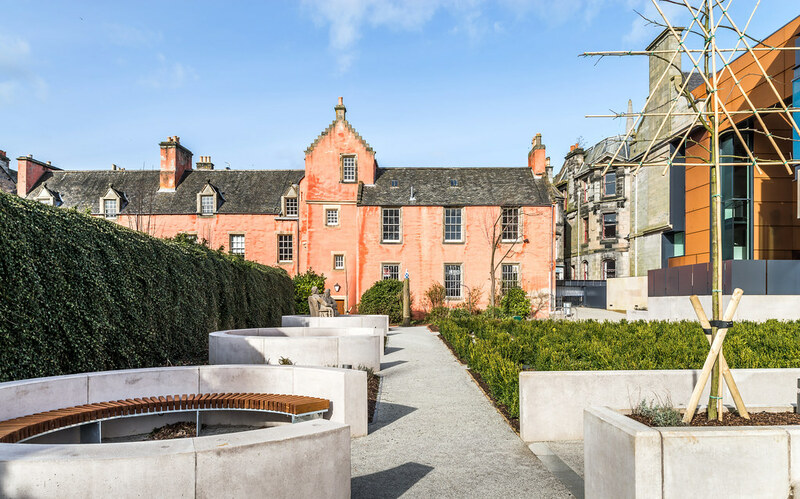 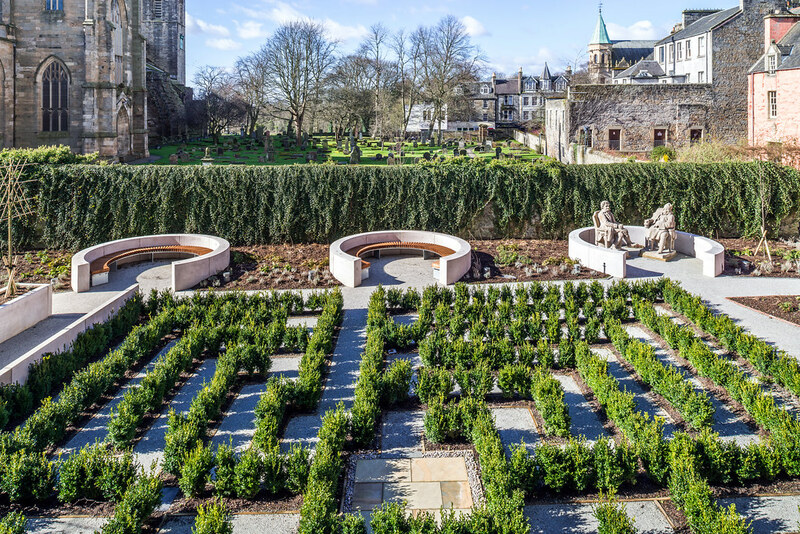 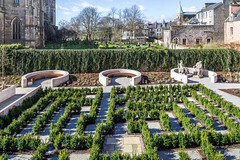 Our garden design merges with the mediaeval garden at the rear of the adjacent Abbott’s House Museum and includes two sculptures from Burns’ Tam O’Shanter and also a small maze. The revised design maintains a top-lit internal street as its organizing device. 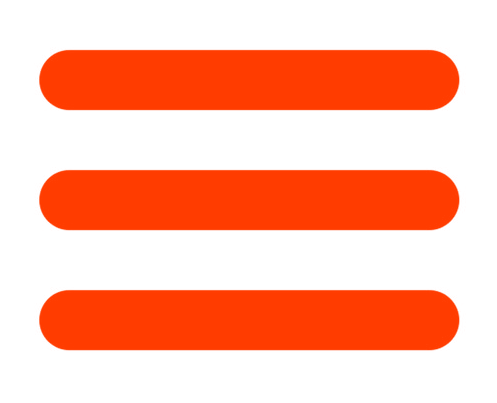 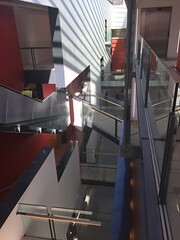 There are three main new spaces. 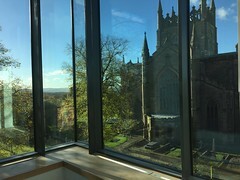 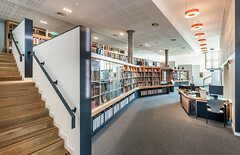 At the lower level is a major new facility for the research and study of local history and its archive organized on a tiered section looking out at the Abbey. 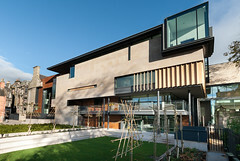 The new library facilities for children is also at this level and opens directly onto a lawn and external auditorium. 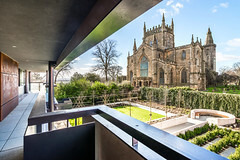 The café is on the first floor with terraces looking out onto the Abbey and graveyard and above this on the same level are the double level museum and the three exhibition galleries. 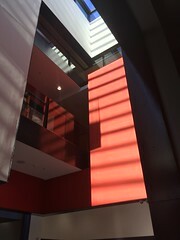 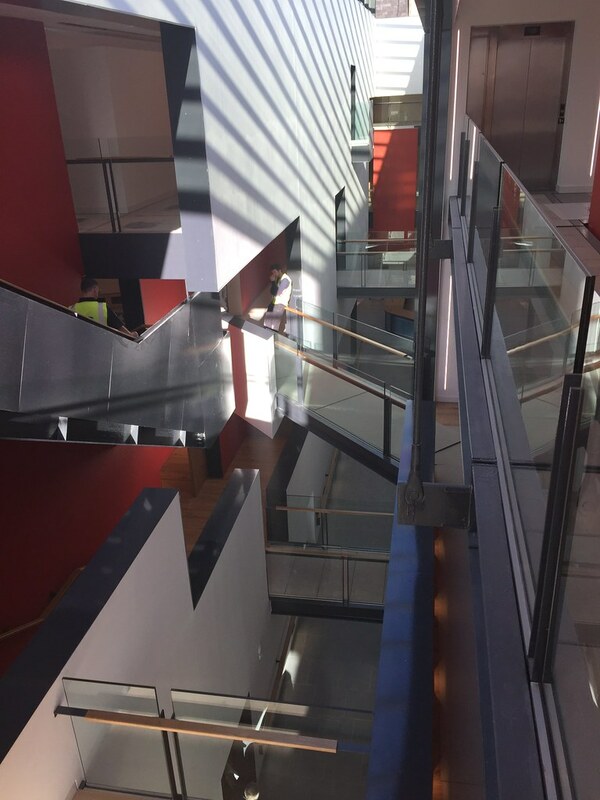 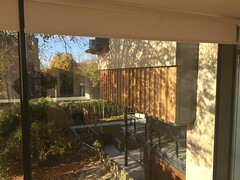 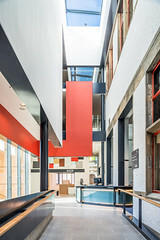 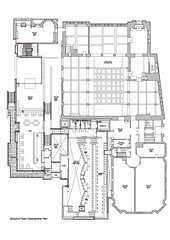 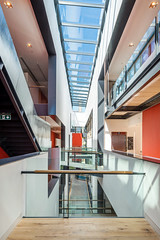 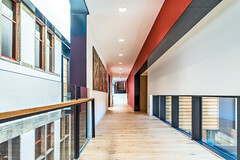 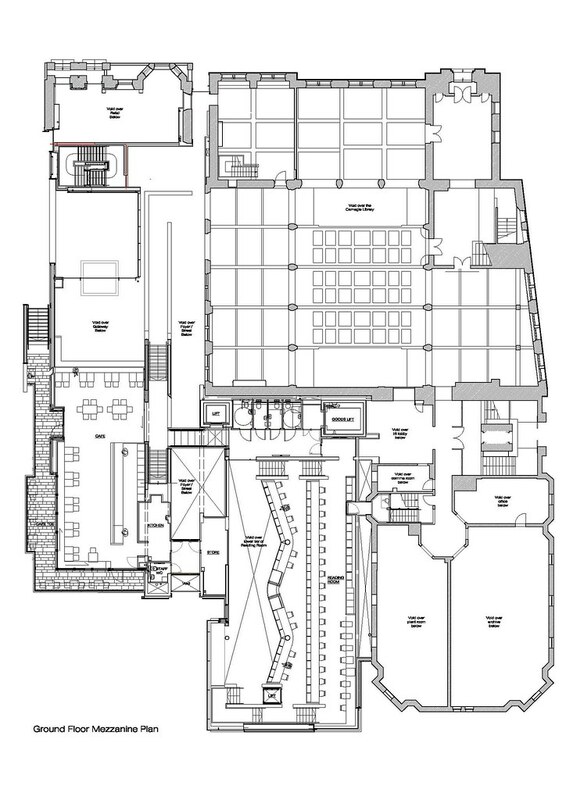 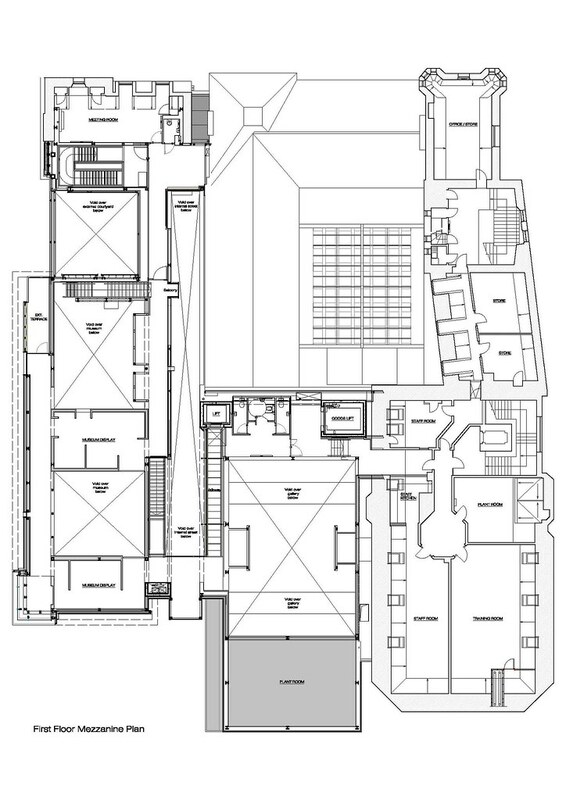 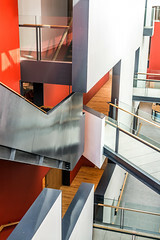 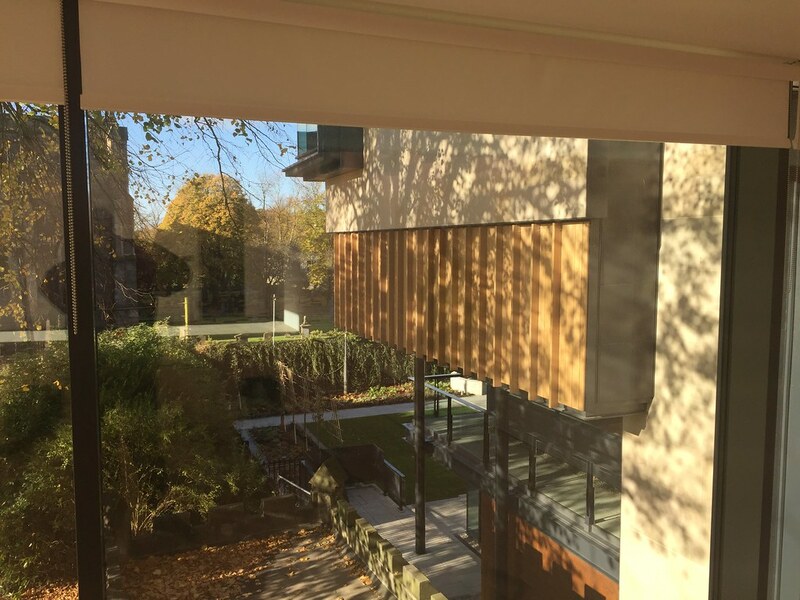 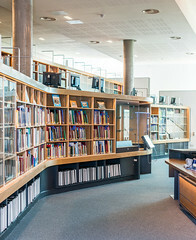 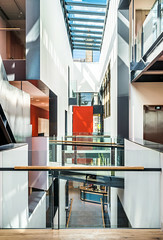 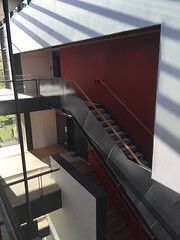 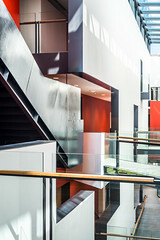 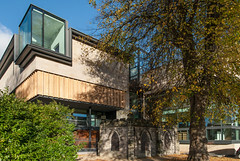 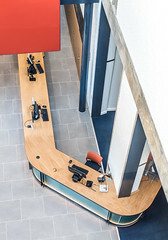 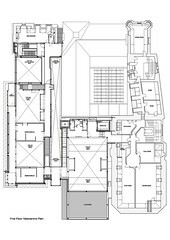 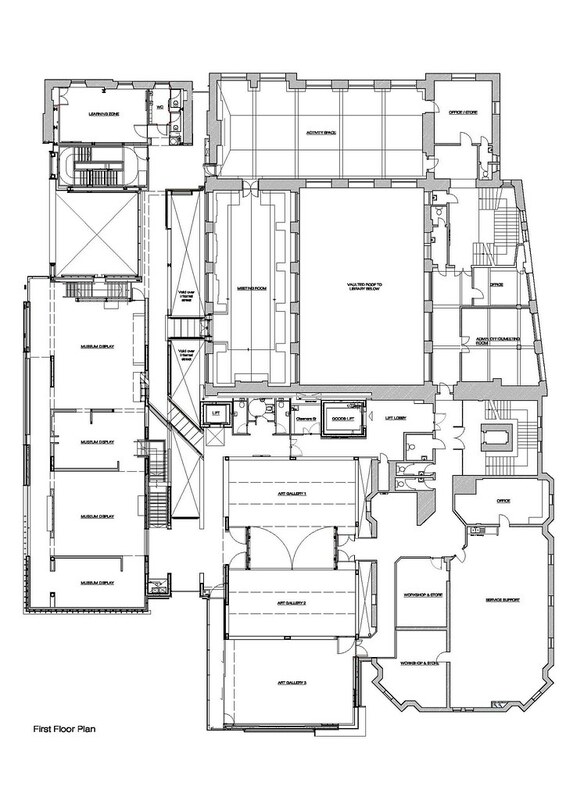 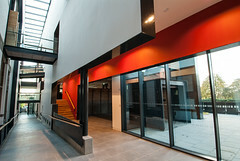 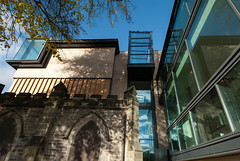 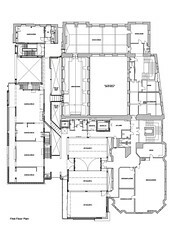 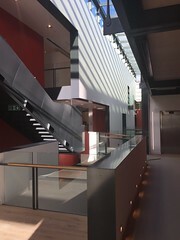 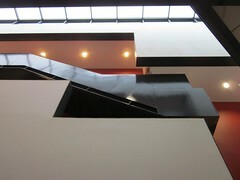 The circulation system is an ‘architectural promenade’ culminating in these facilities but also continuing back into the main building and allowing access to two main existing spaces in the library, the Murison Burns Room which becomes a meeting / function space and the adjacent reference library which will become an activity and lecture space. 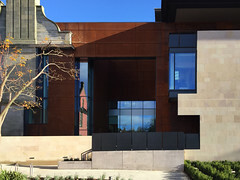 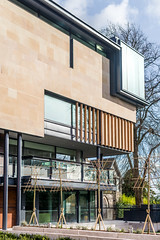 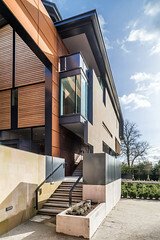 Externally, the materials are a combination of stone, oak and corten steel. 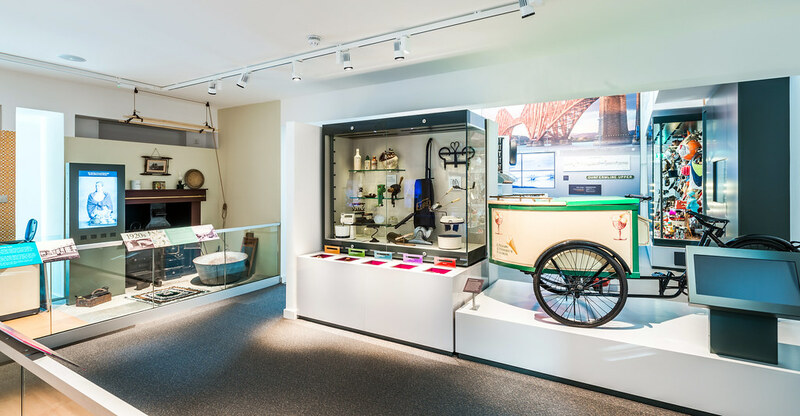 The latter is to designate the fact that a majority of the museum displays the industrial heritage of the town. 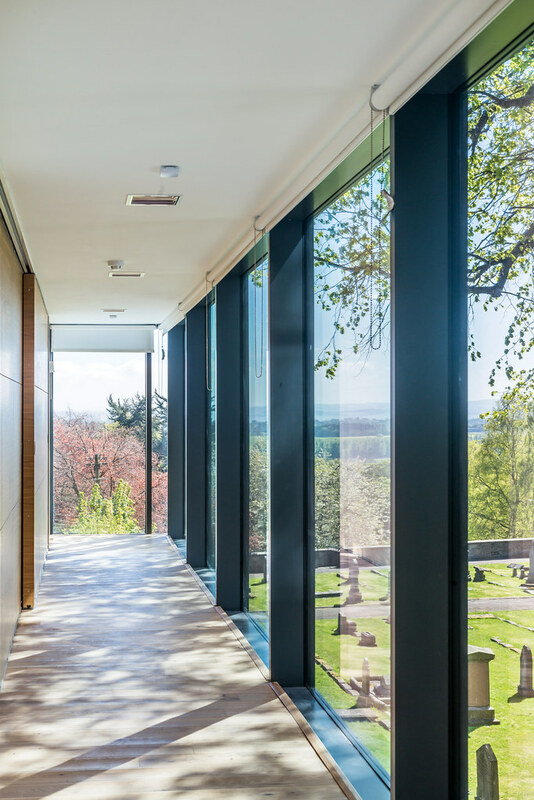 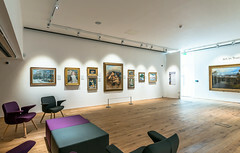 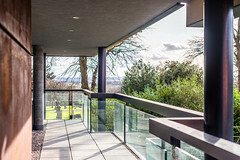 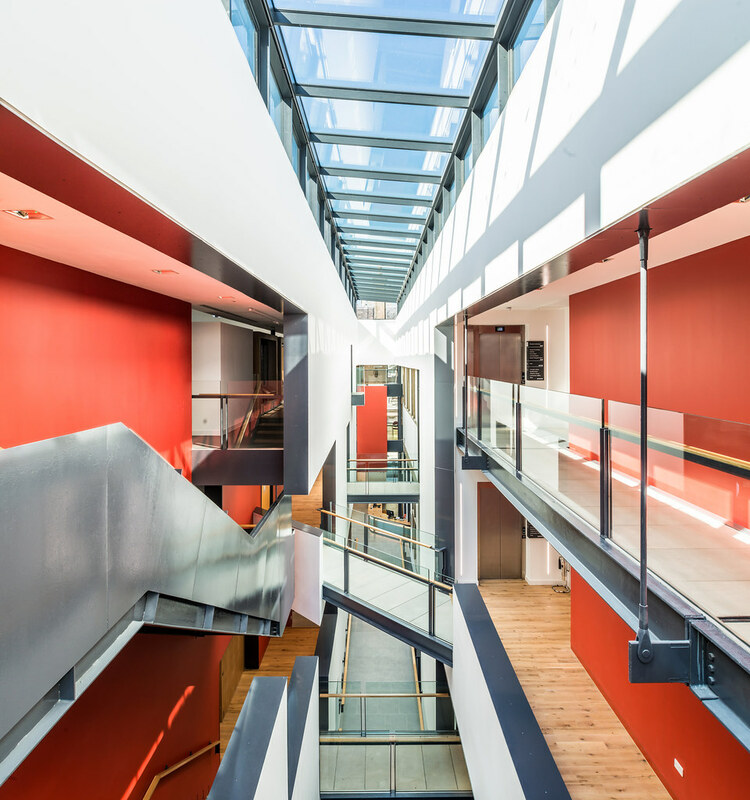 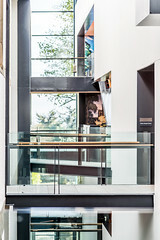 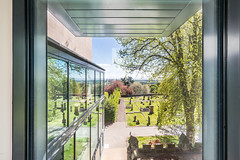 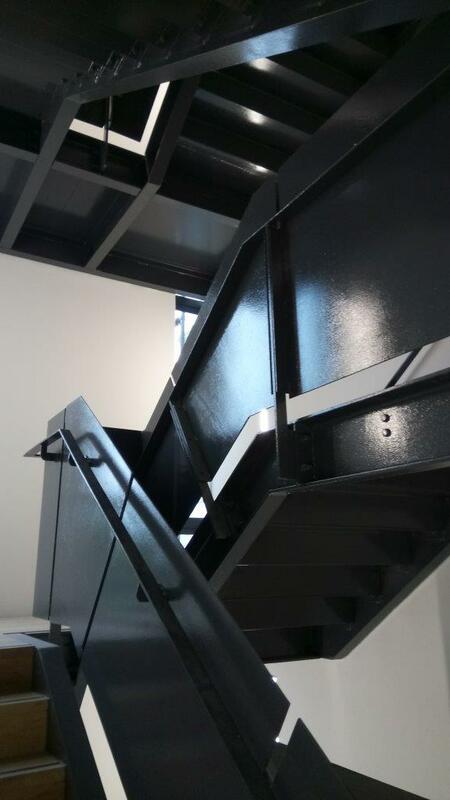 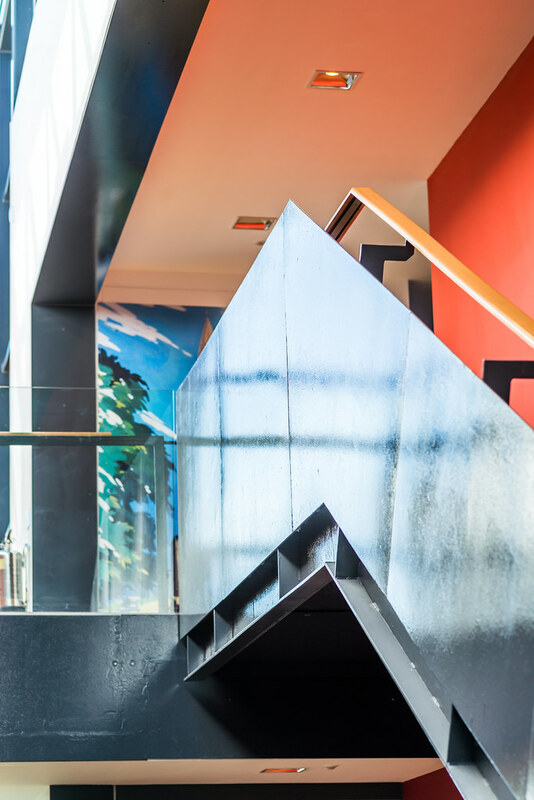 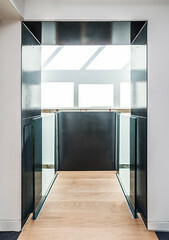 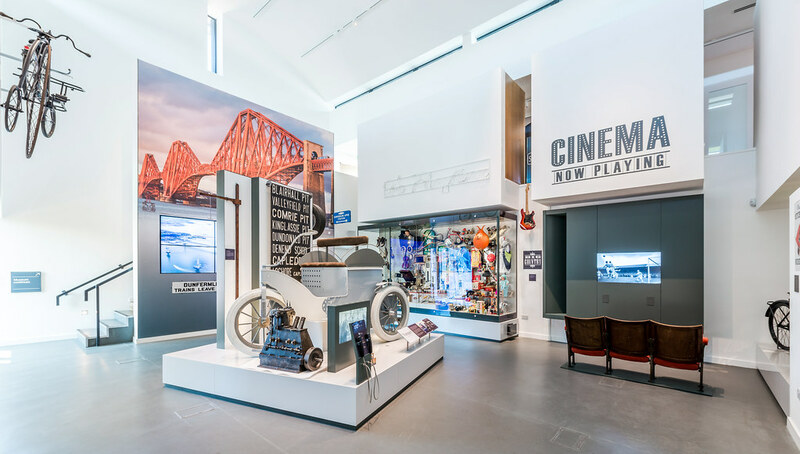 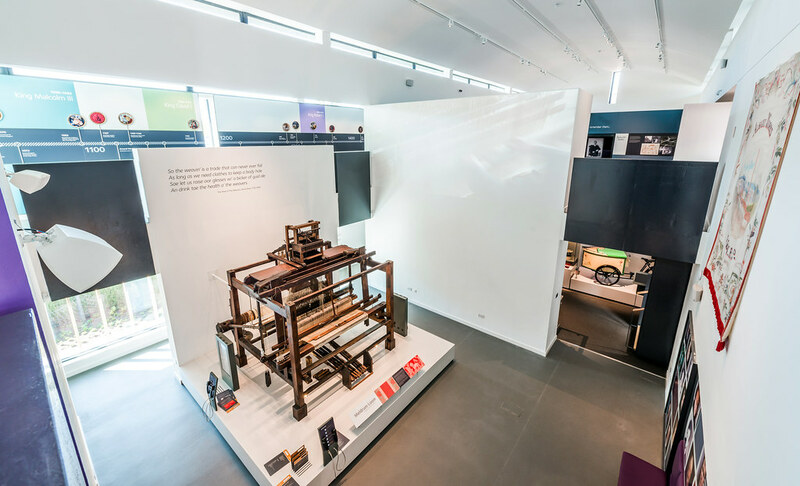 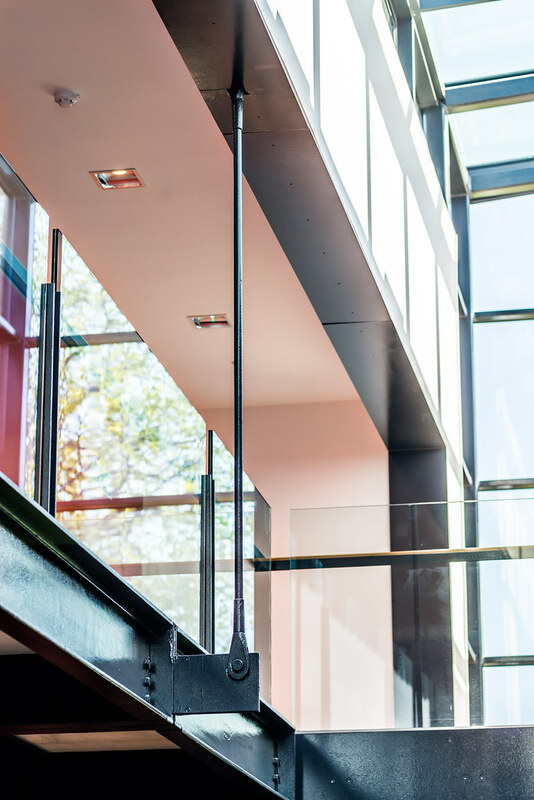 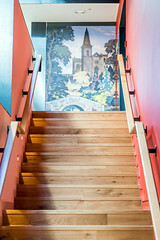 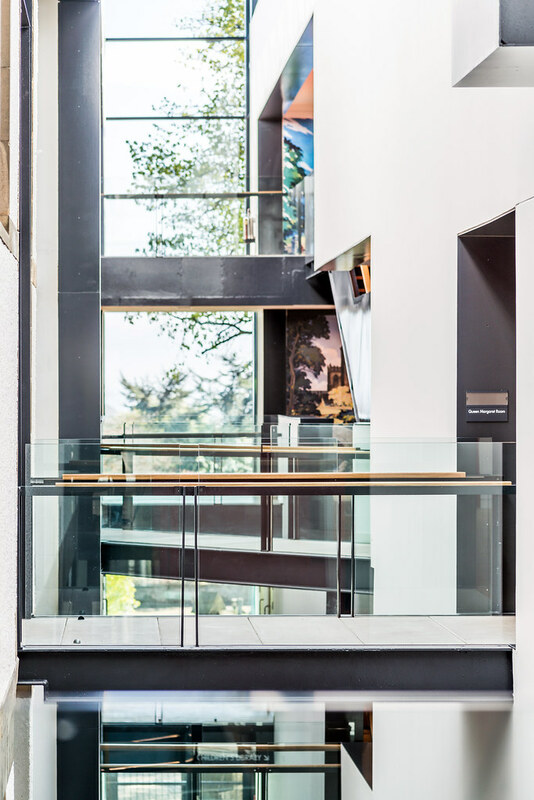 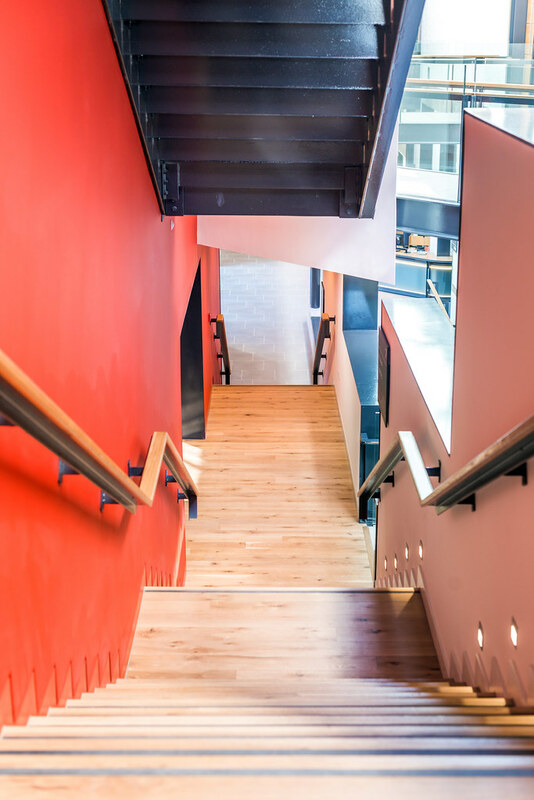 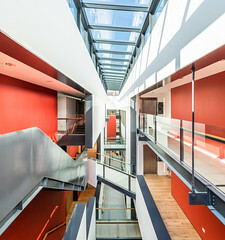 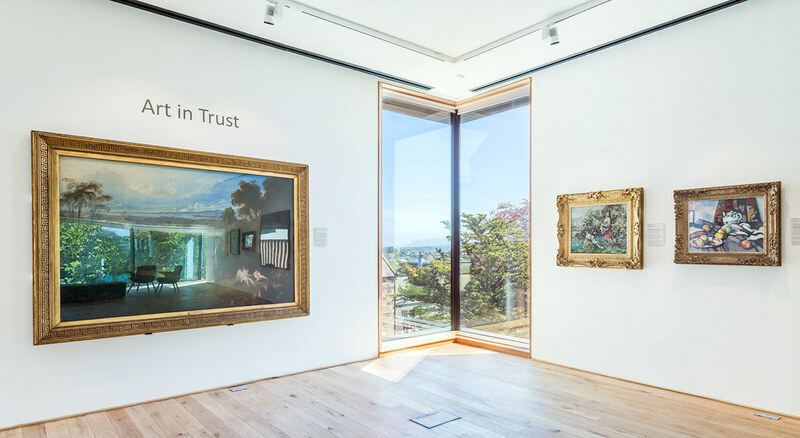 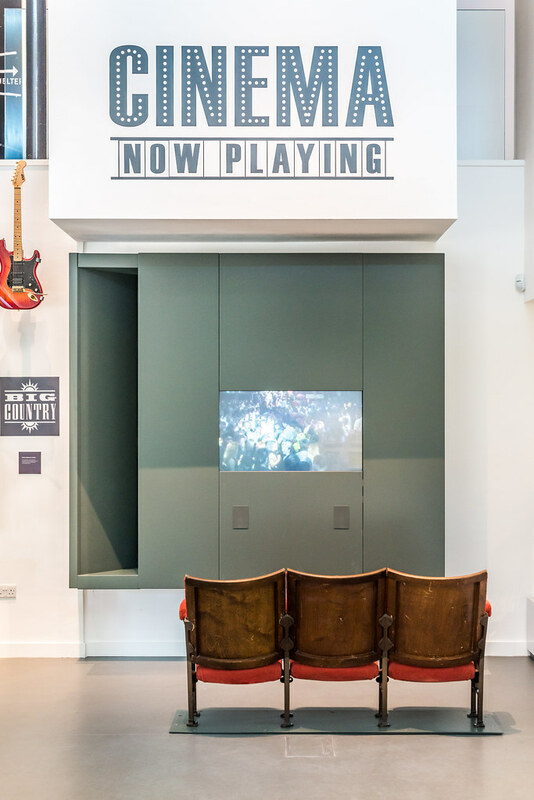 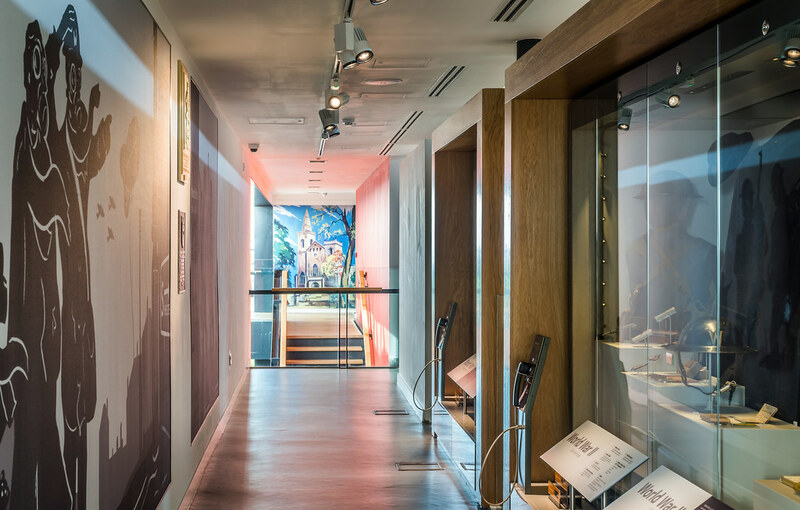 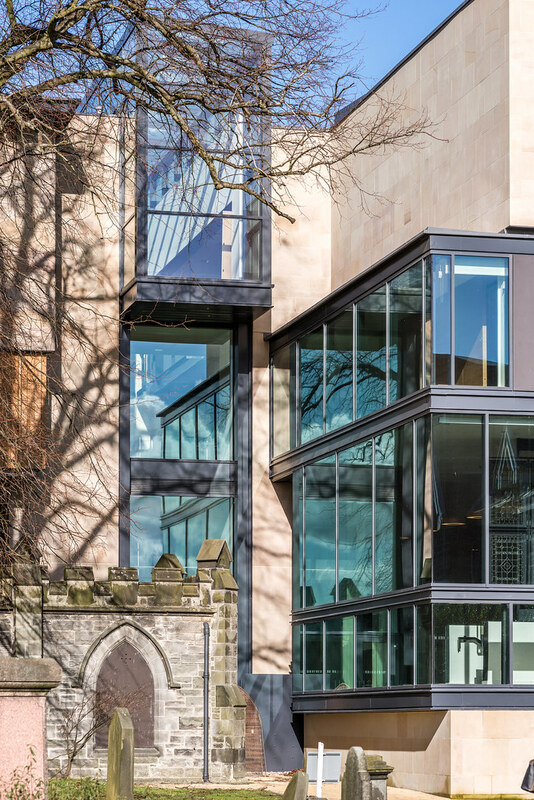 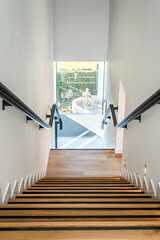 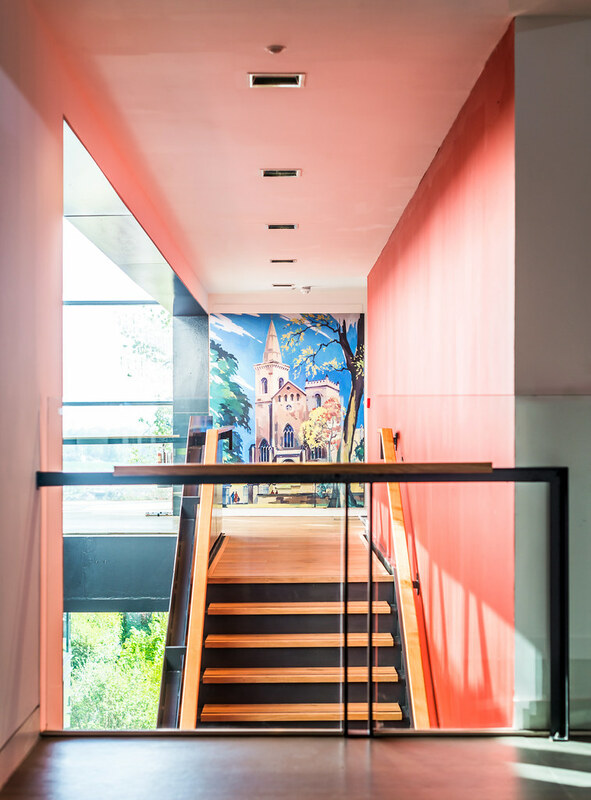 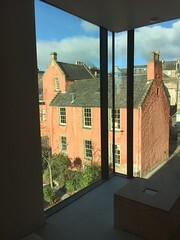 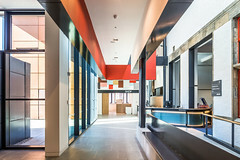 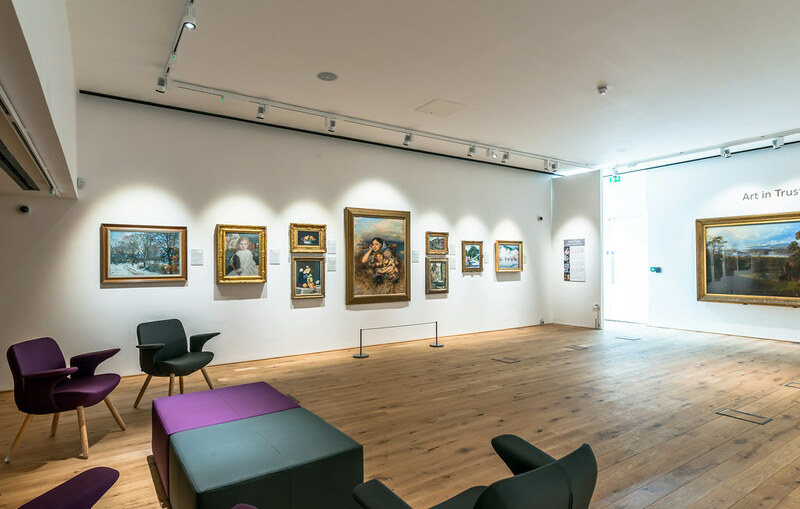 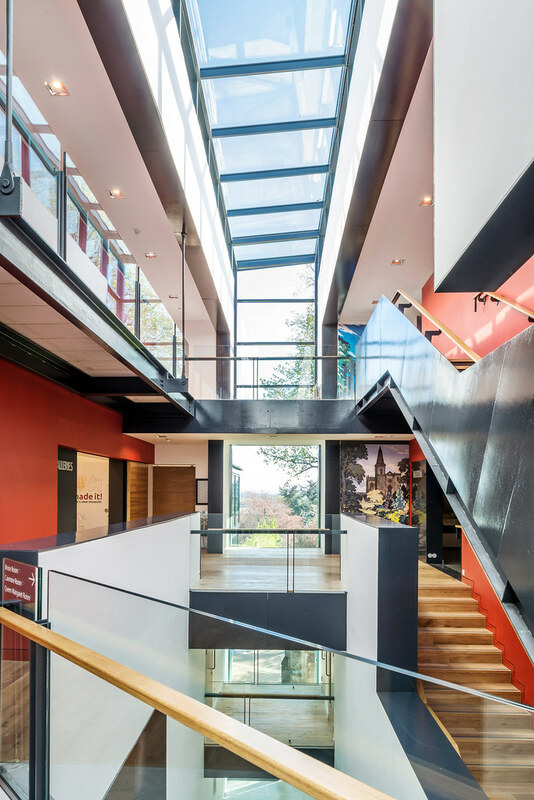 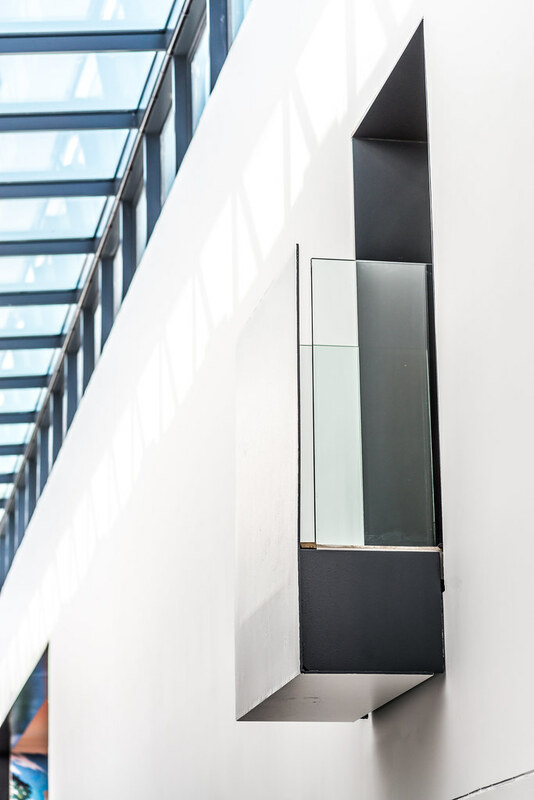 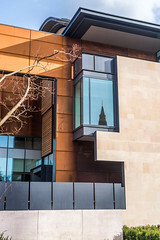 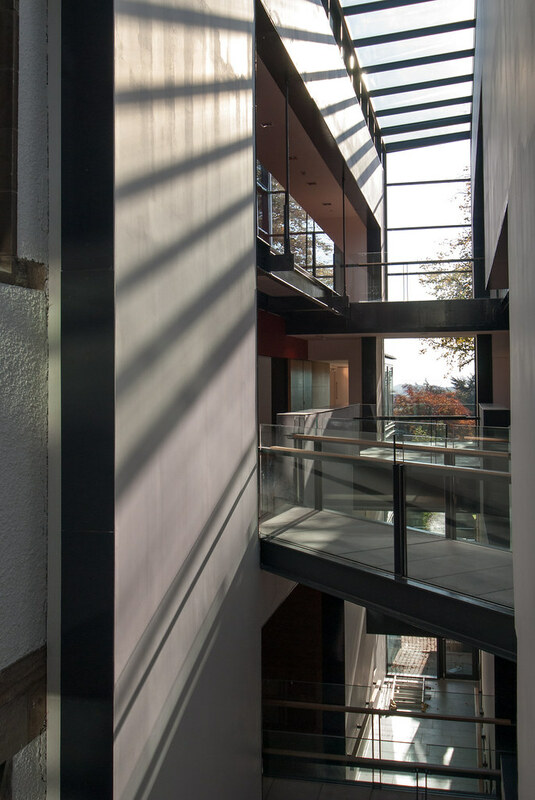 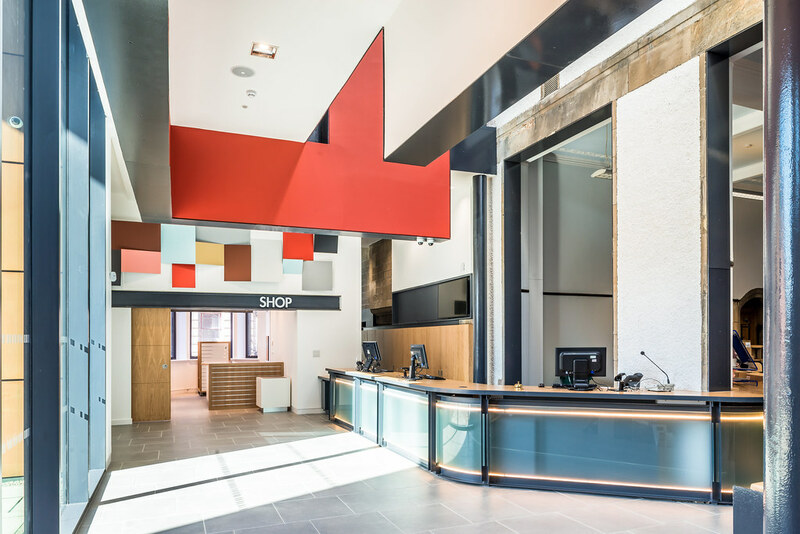 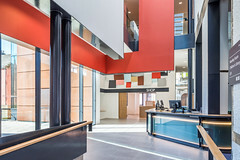 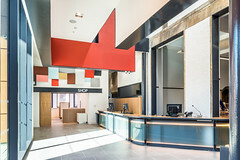 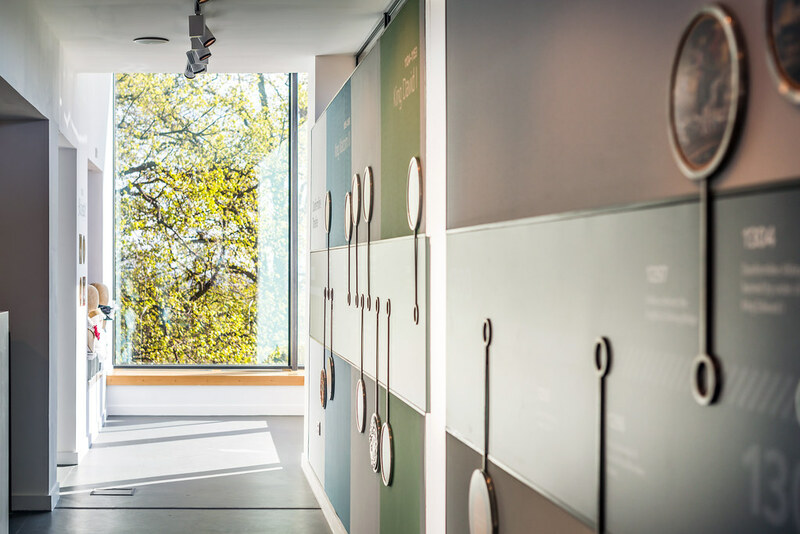 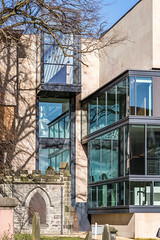 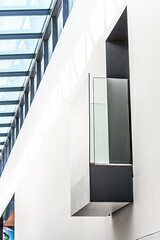 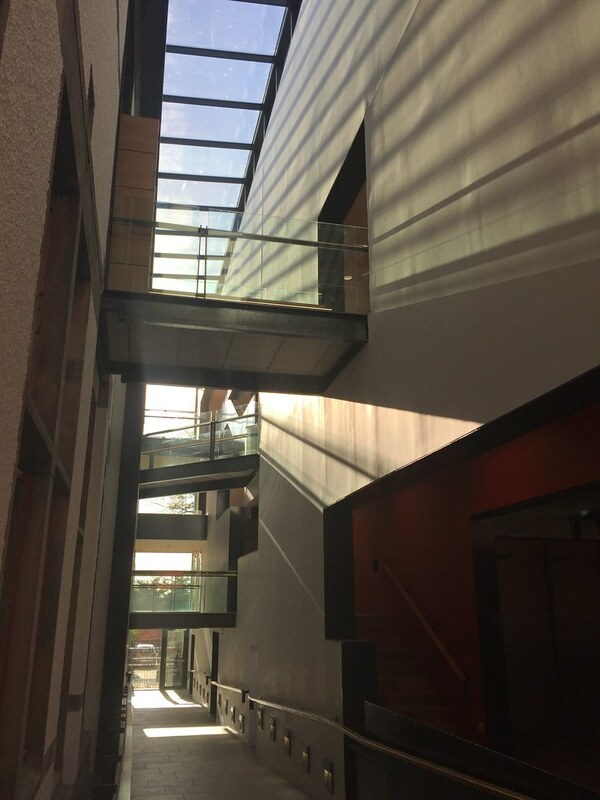 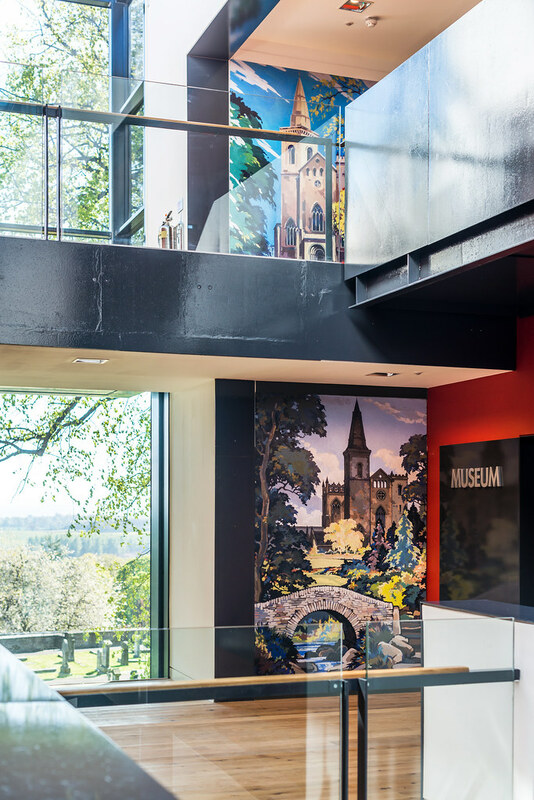 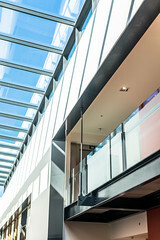 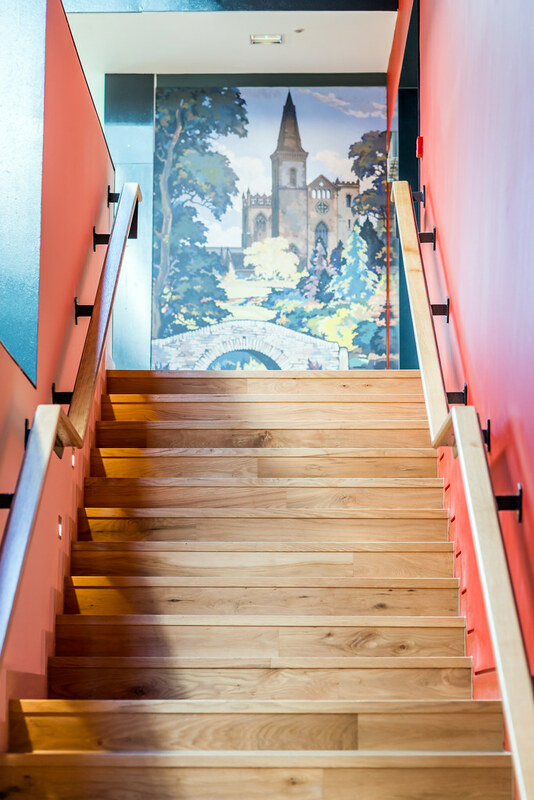 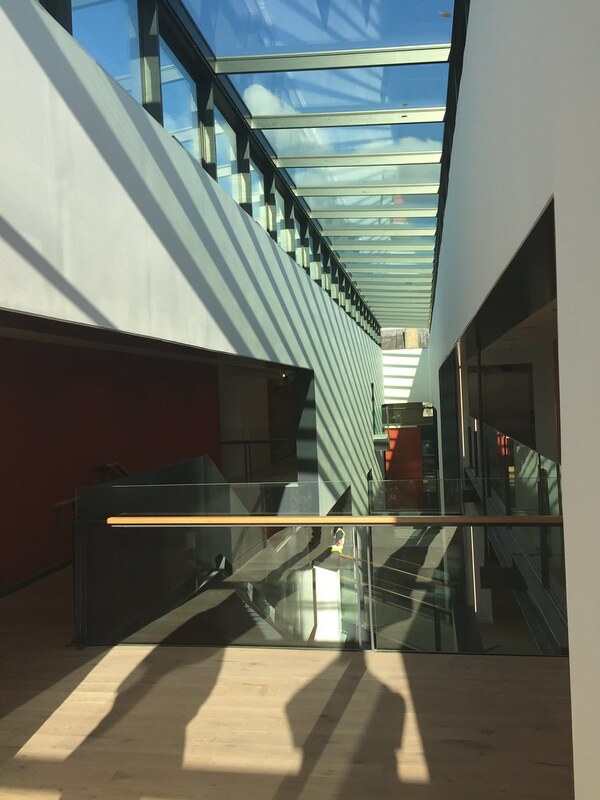 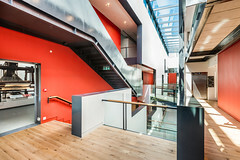 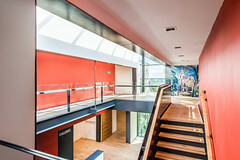 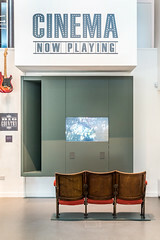 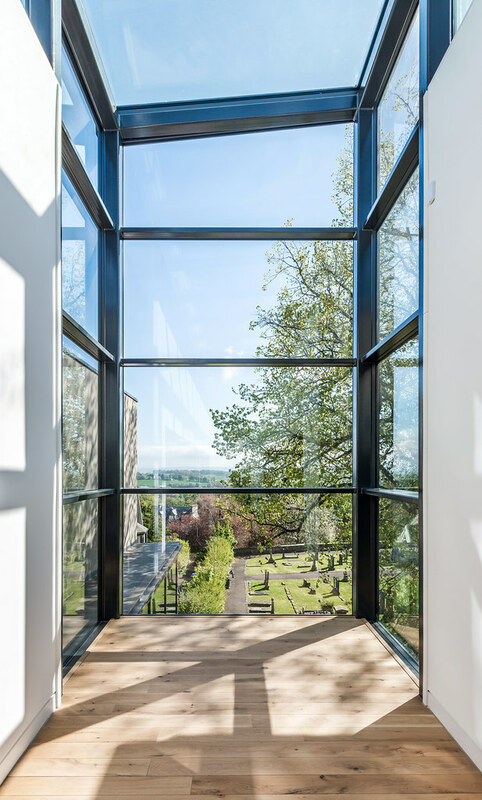 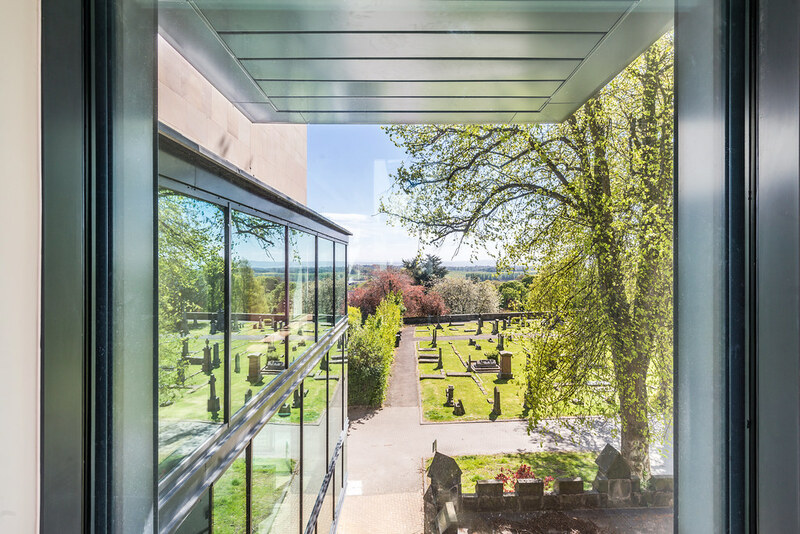 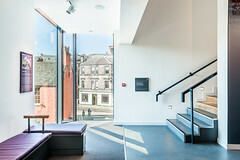 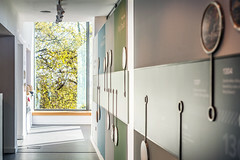 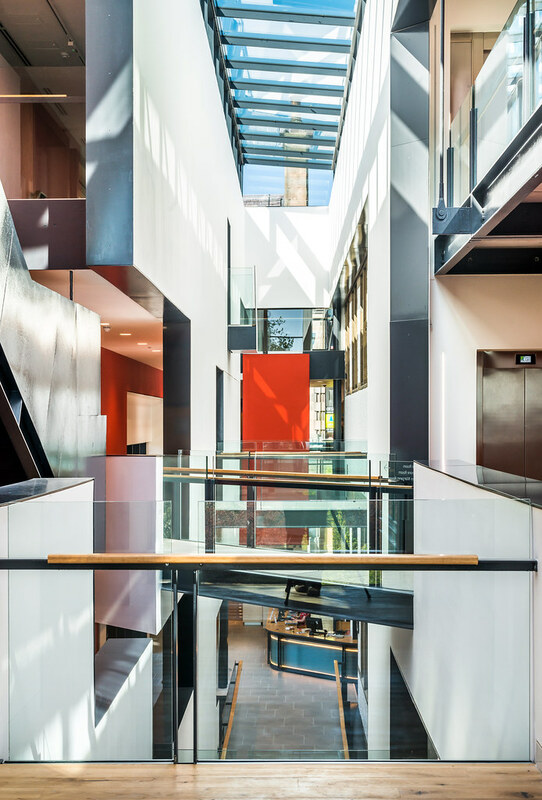 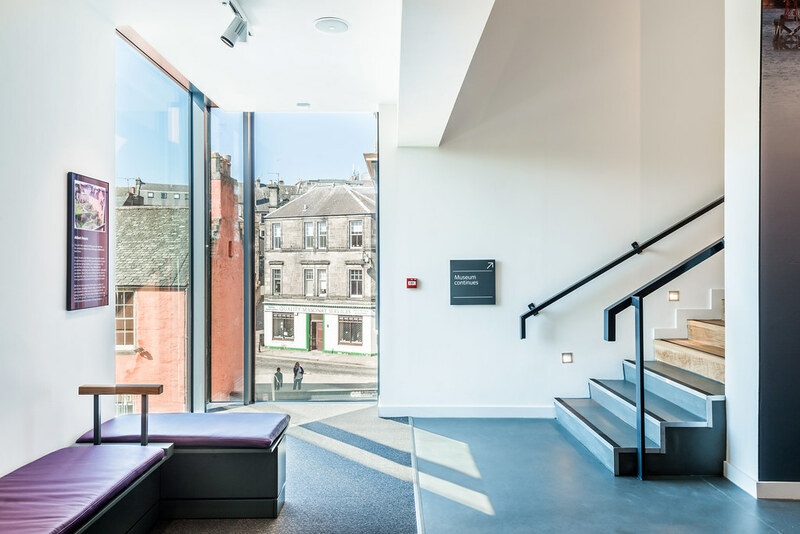 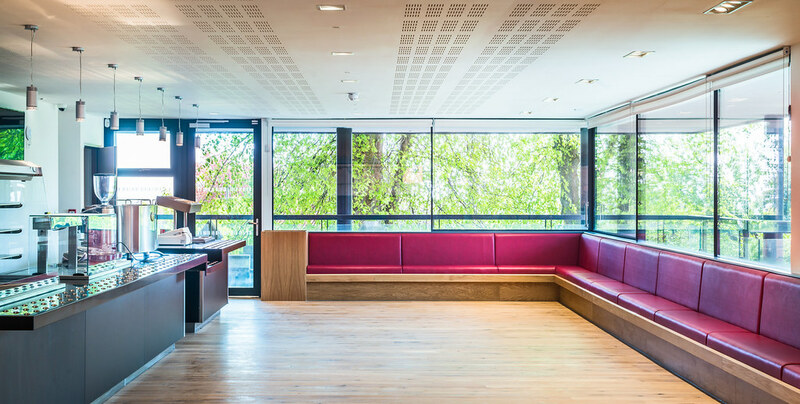 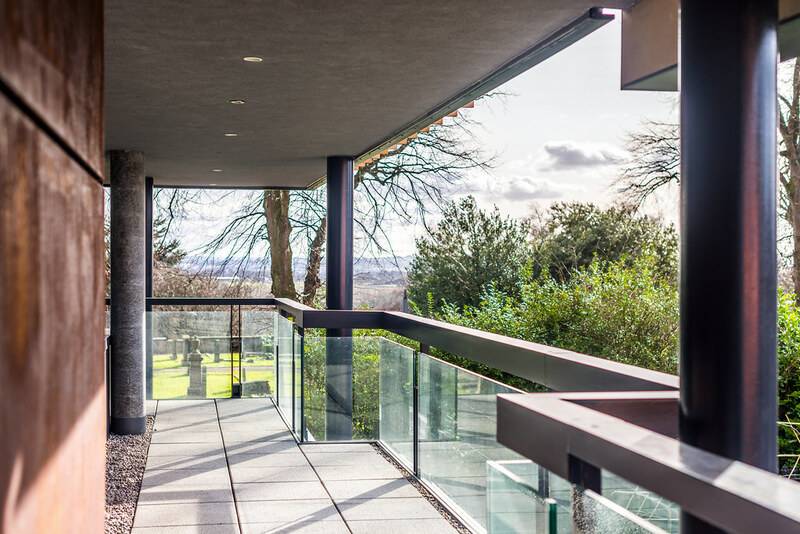 A major feature of the museum itself, which has been designed in collaboration with Redman Design, is that there are internal framed views of significant nearby historic buildings. 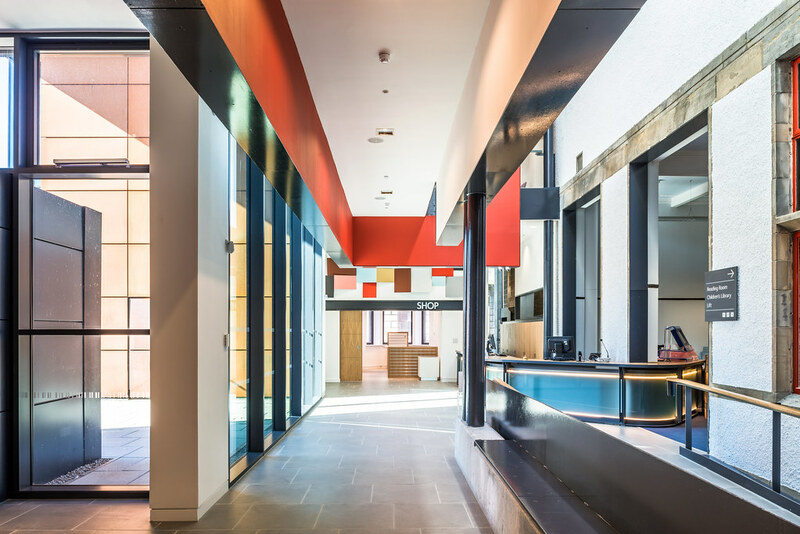 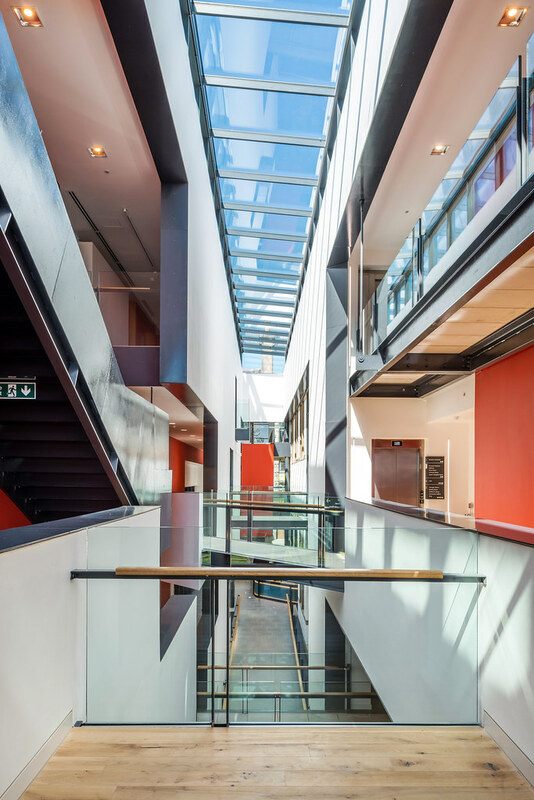 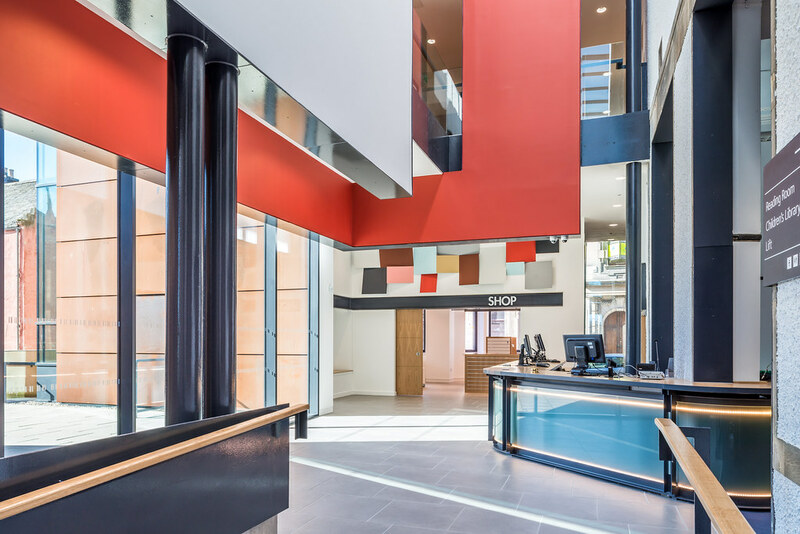 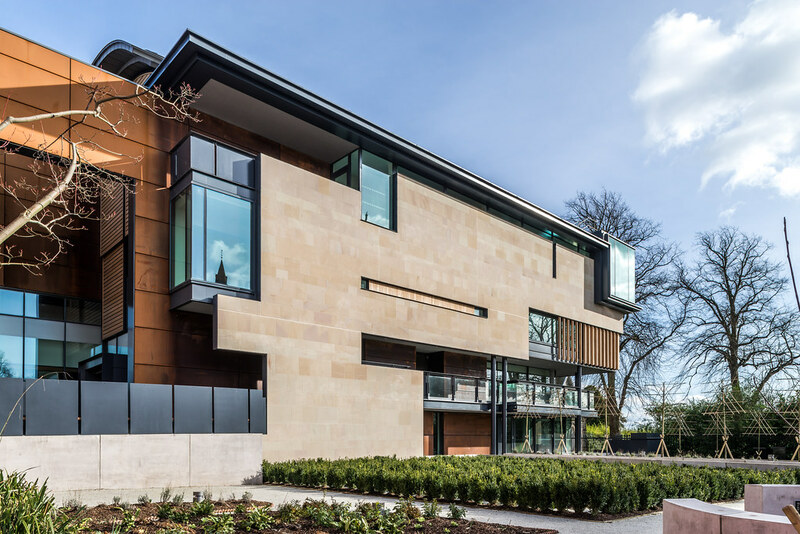 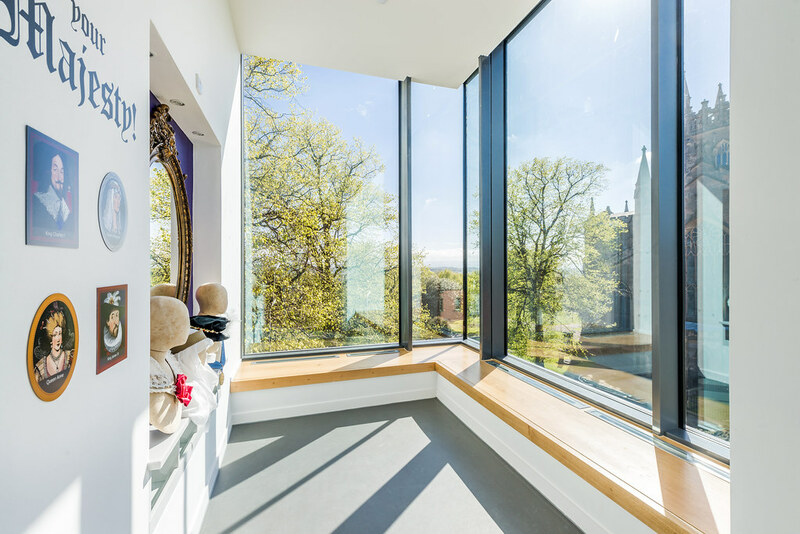 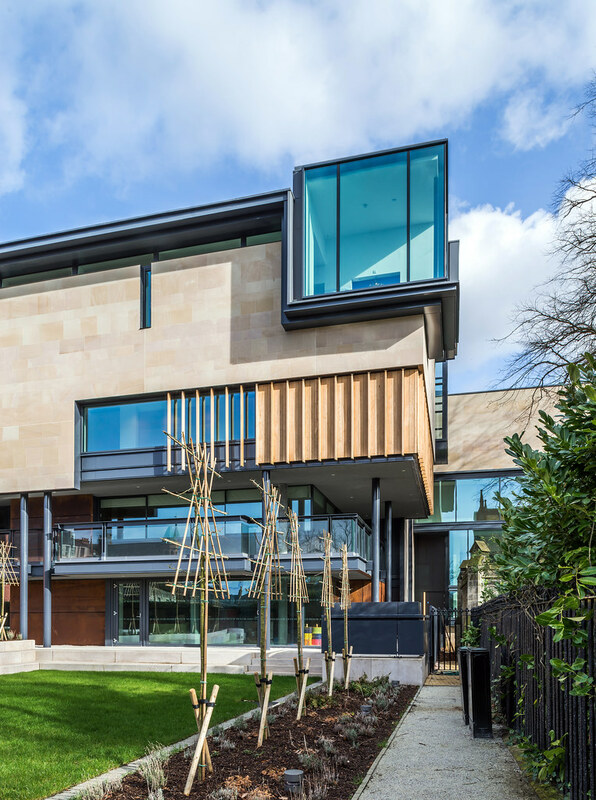 The project opened to the public in May 2017 and has subsequently won an RIAS 2017 Award and the RIAS Best Building in Scotland Award 2017.